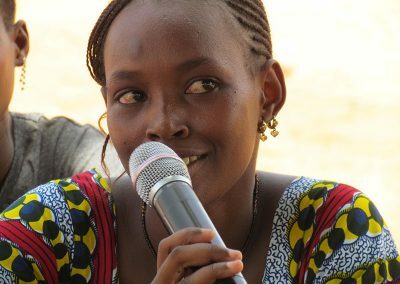 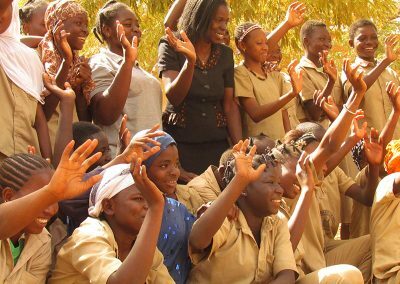 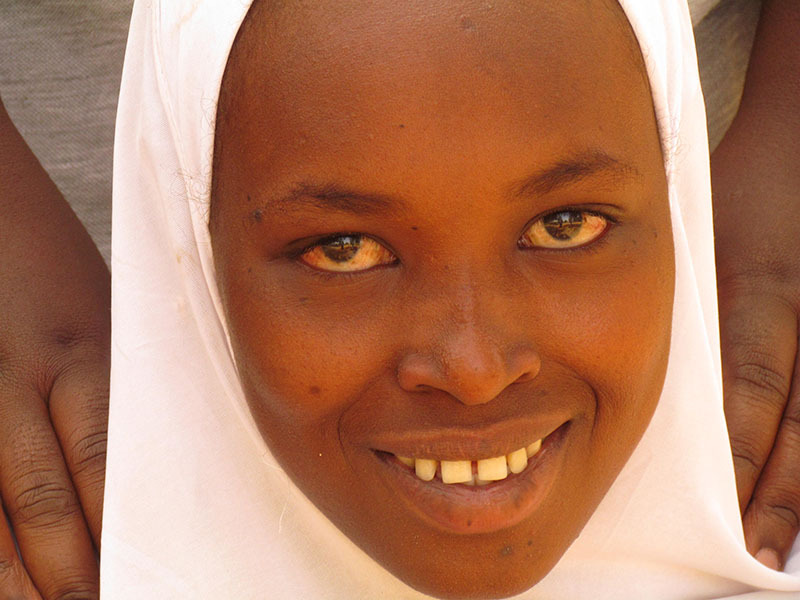 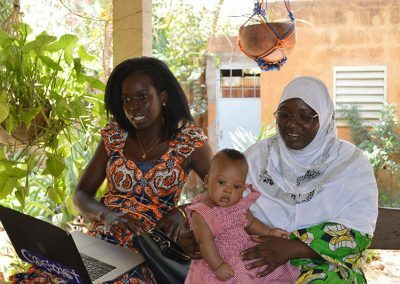 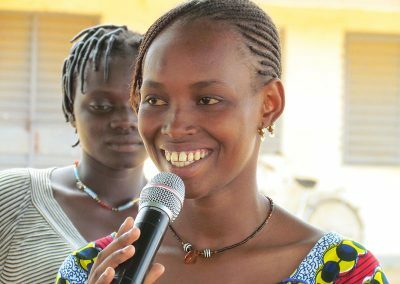 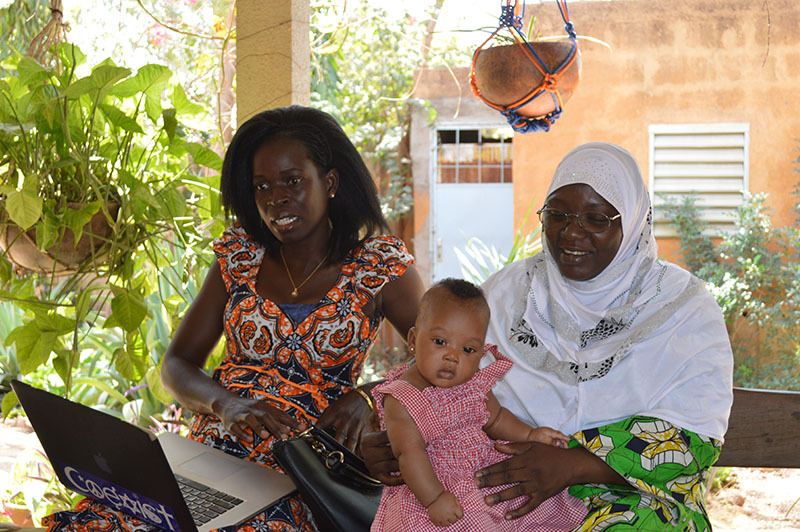 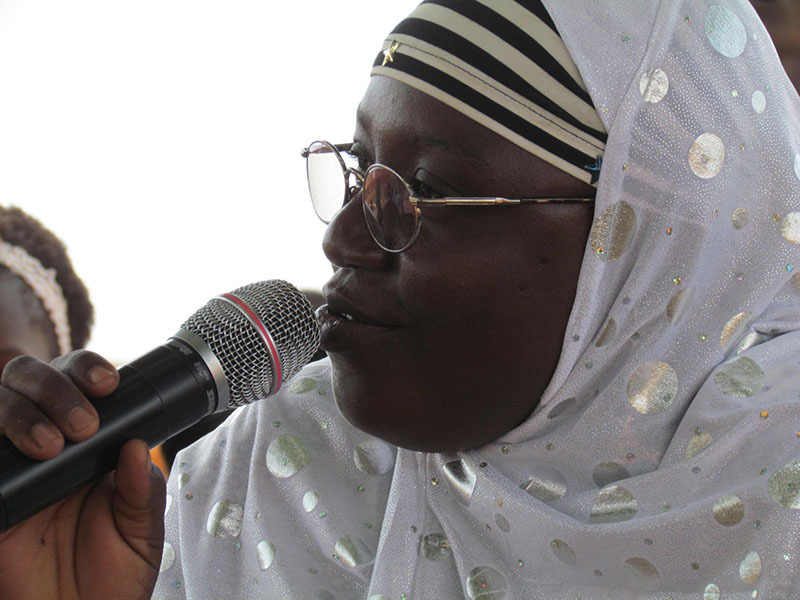 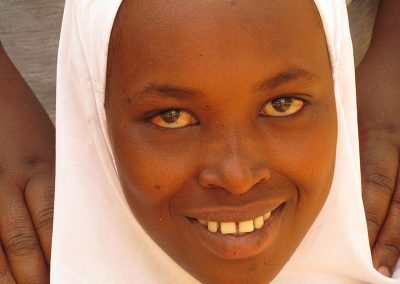 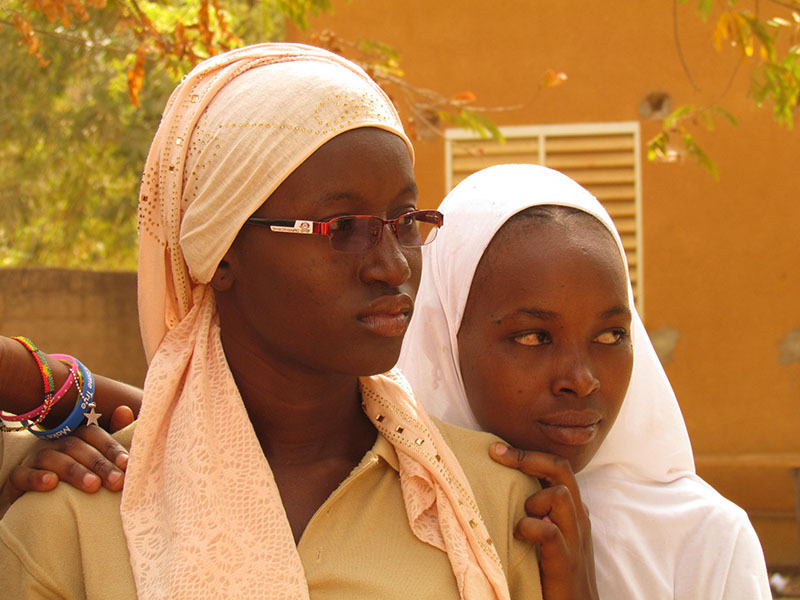 In 2017, after a successful crowdfunding campaign, BARKA implemented a project to empower girls by taking control over their own bodies and lives through hygienically managing their menstruation. 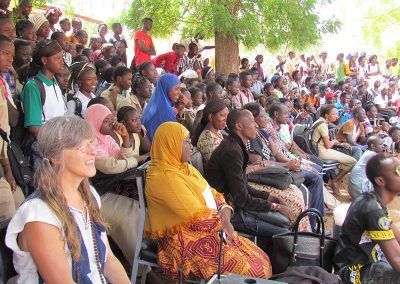 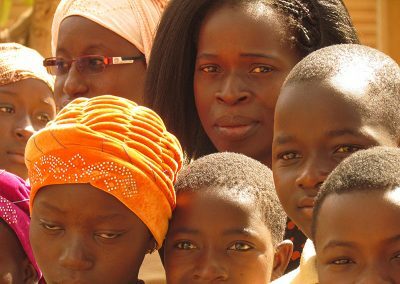 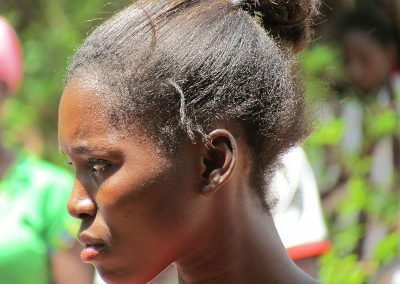 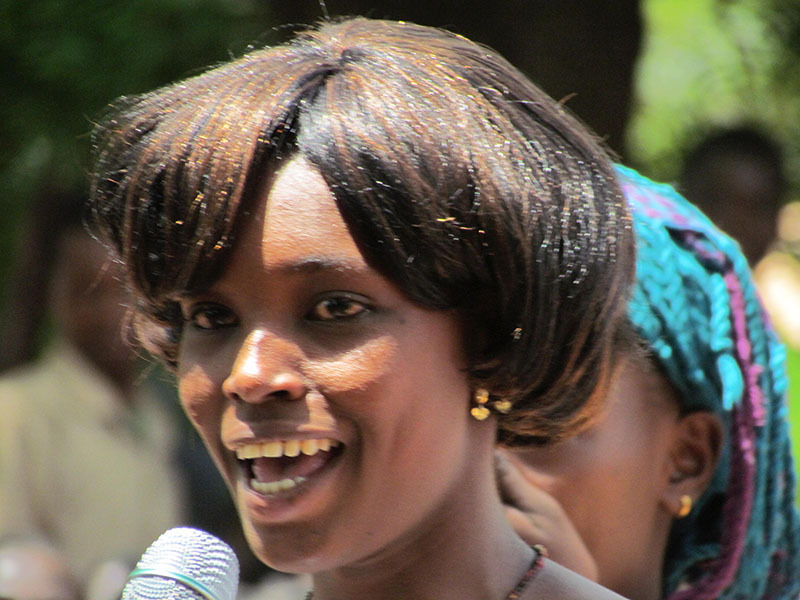 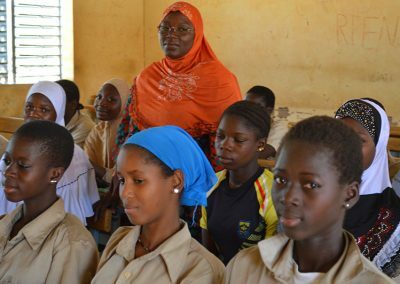 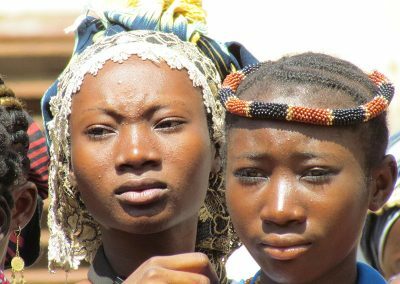 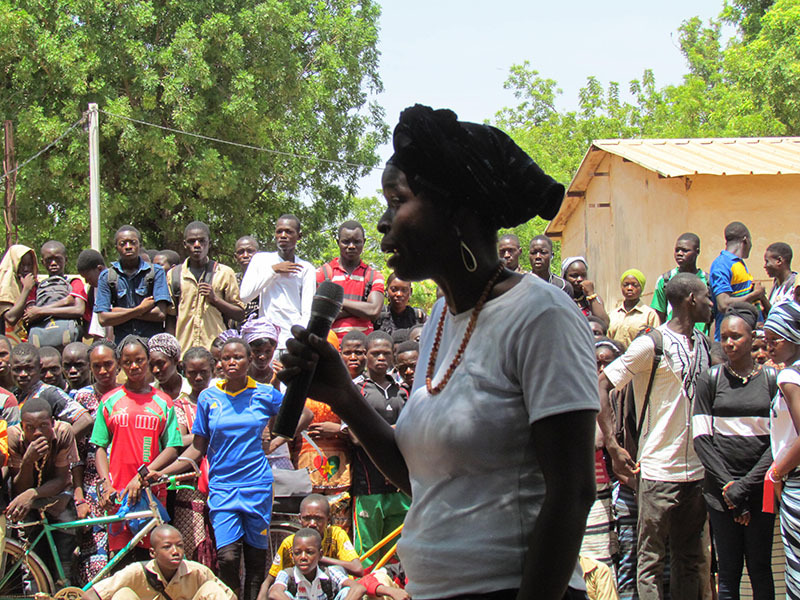 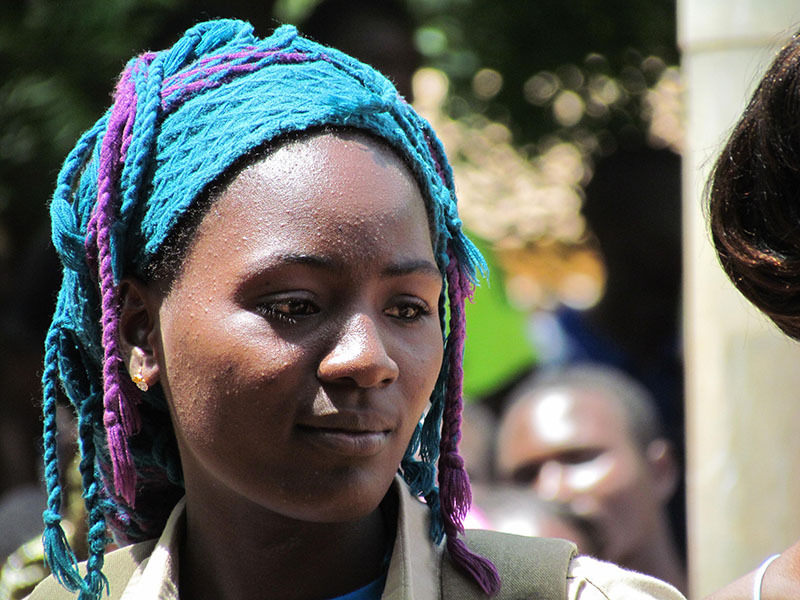 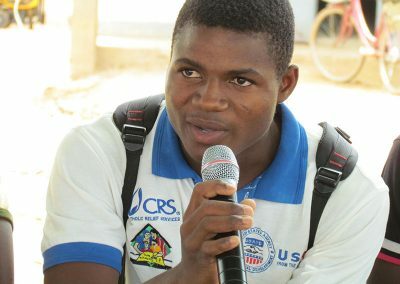 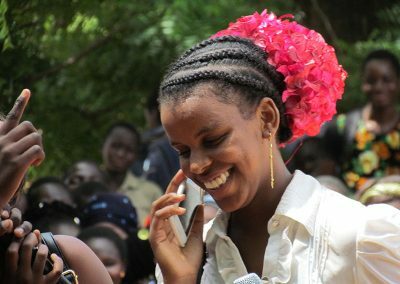 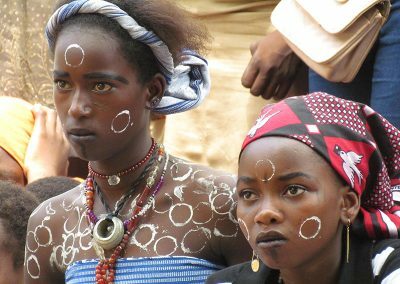 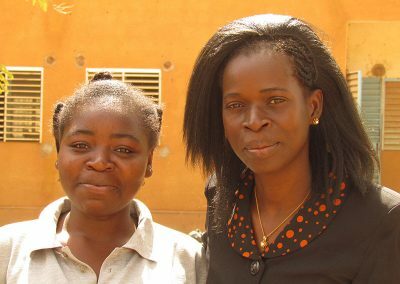 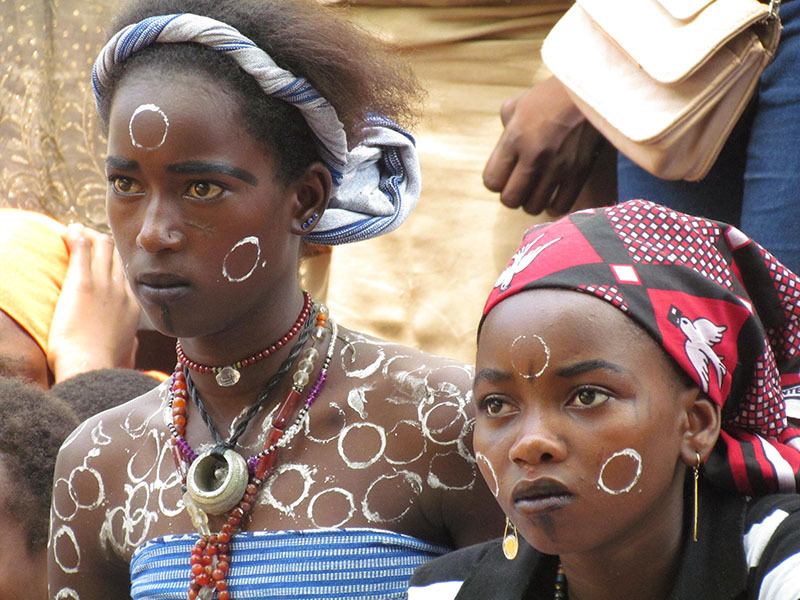 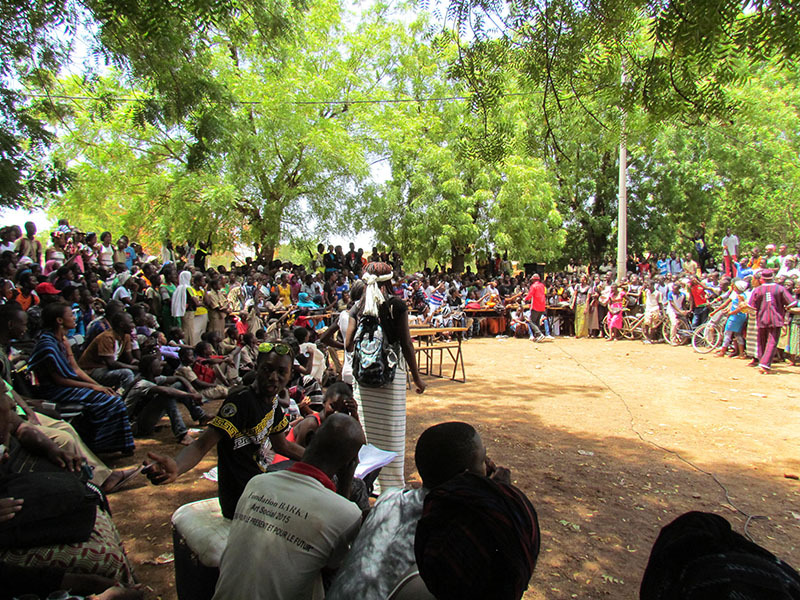 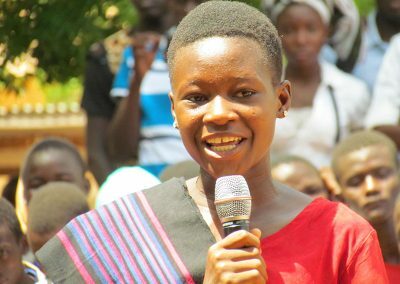 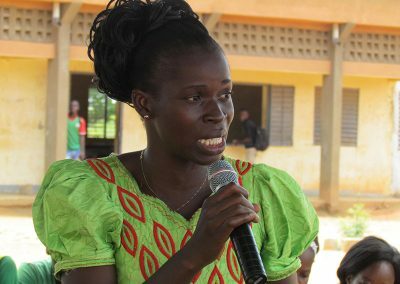 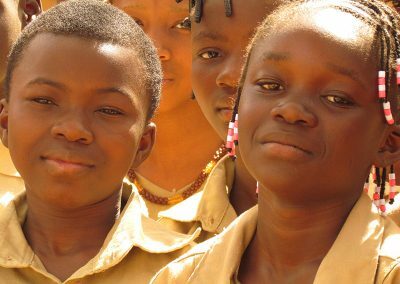 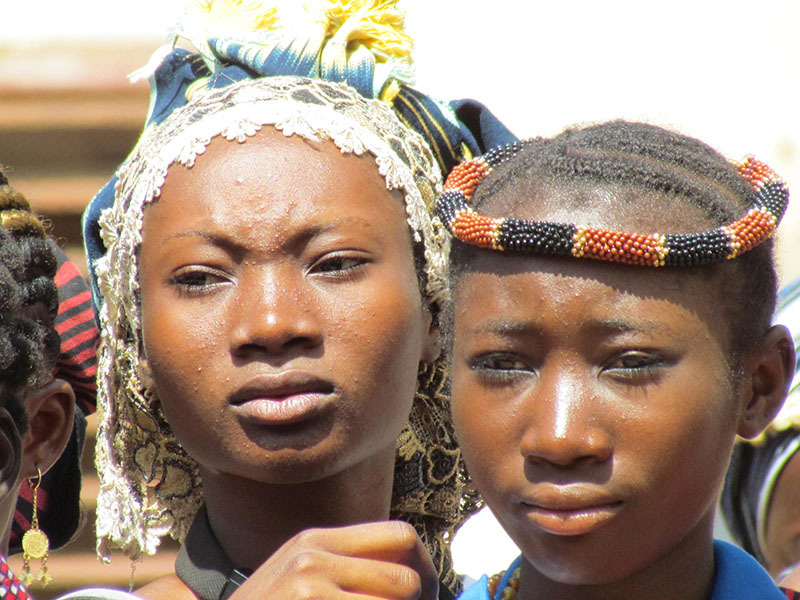 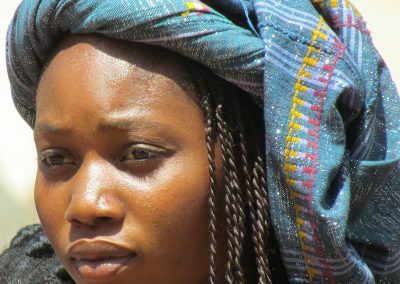 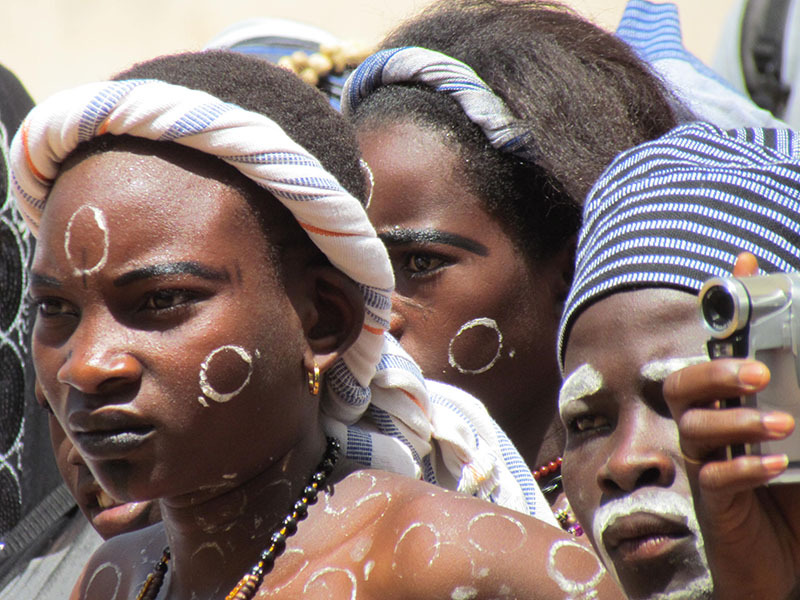 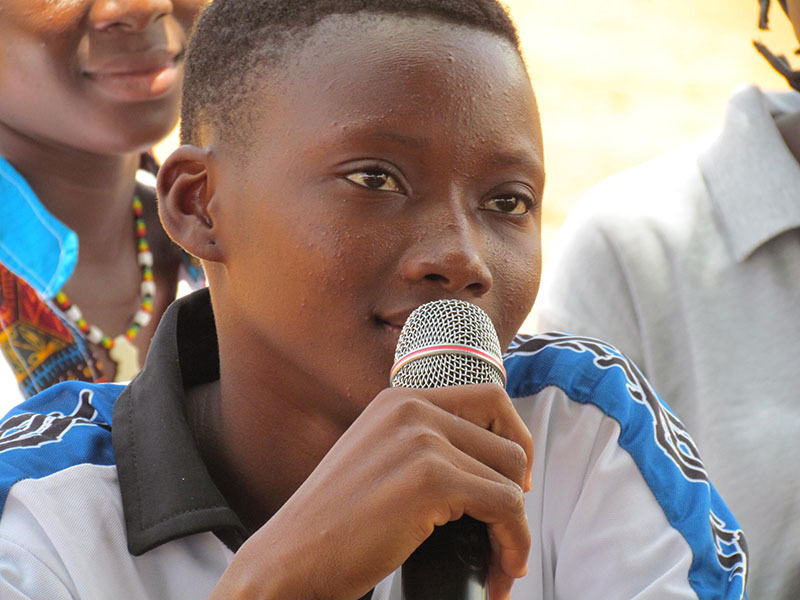 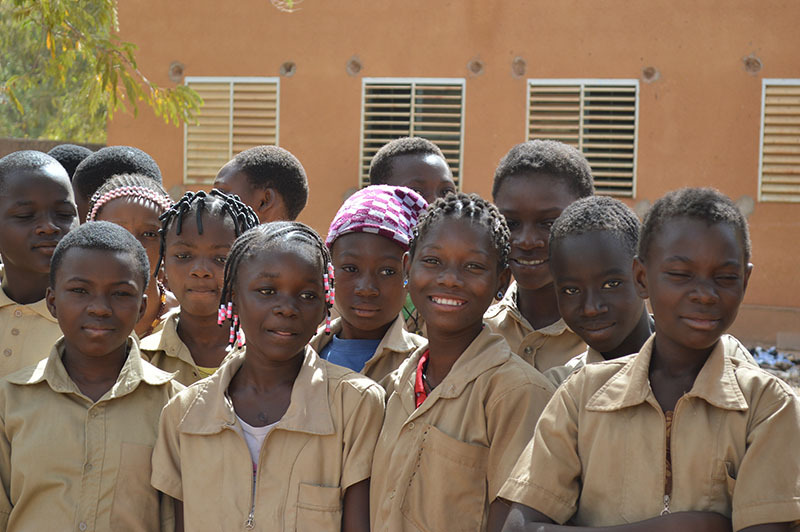 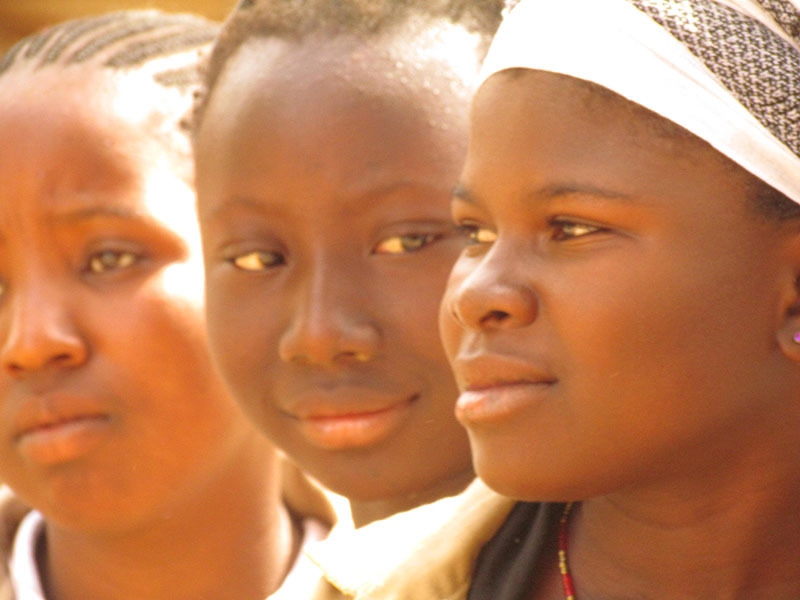 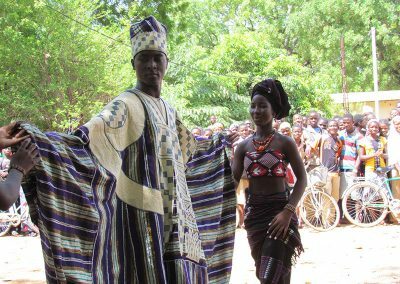 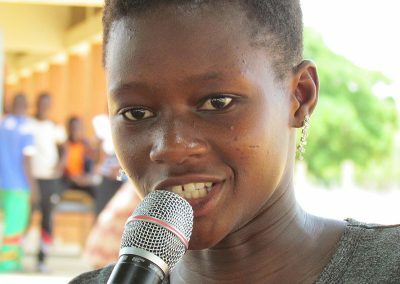 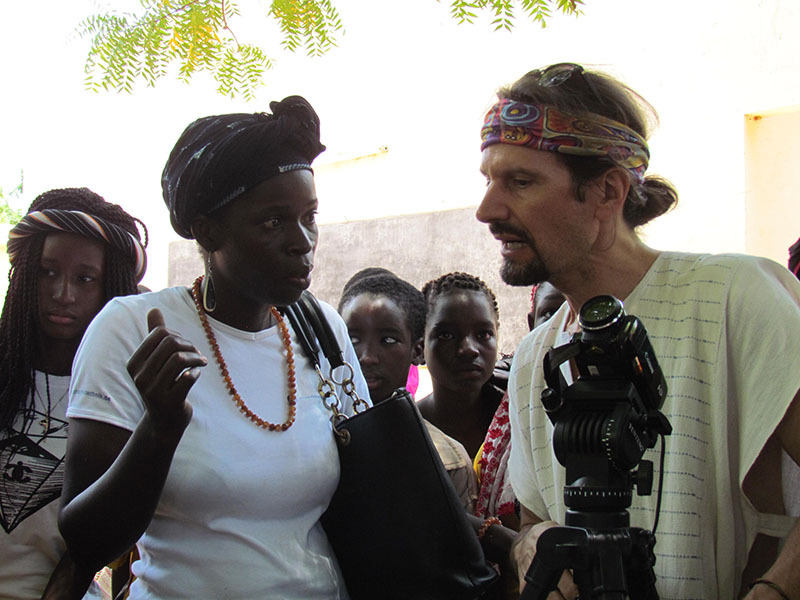 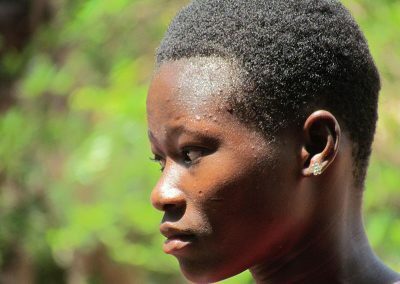 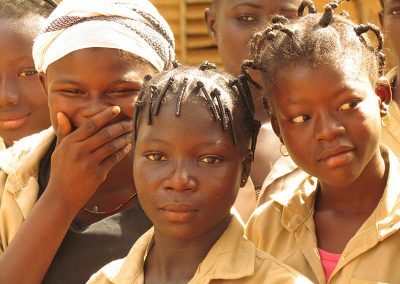 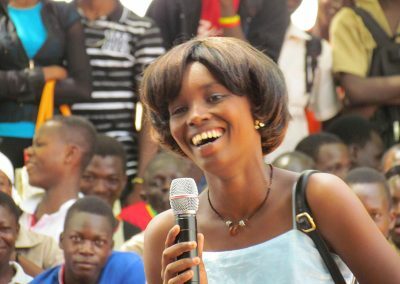 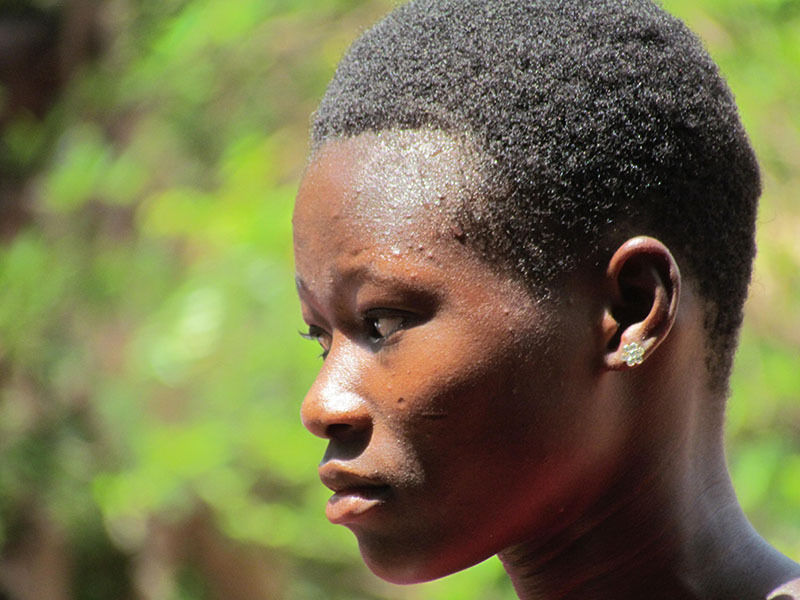 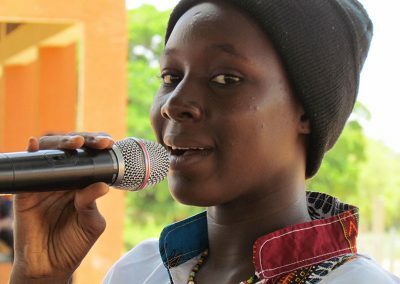 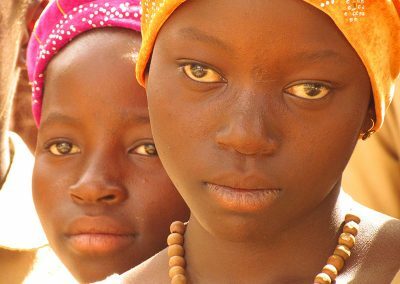 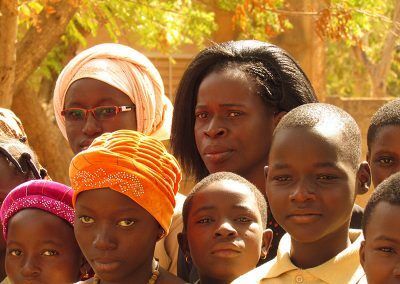 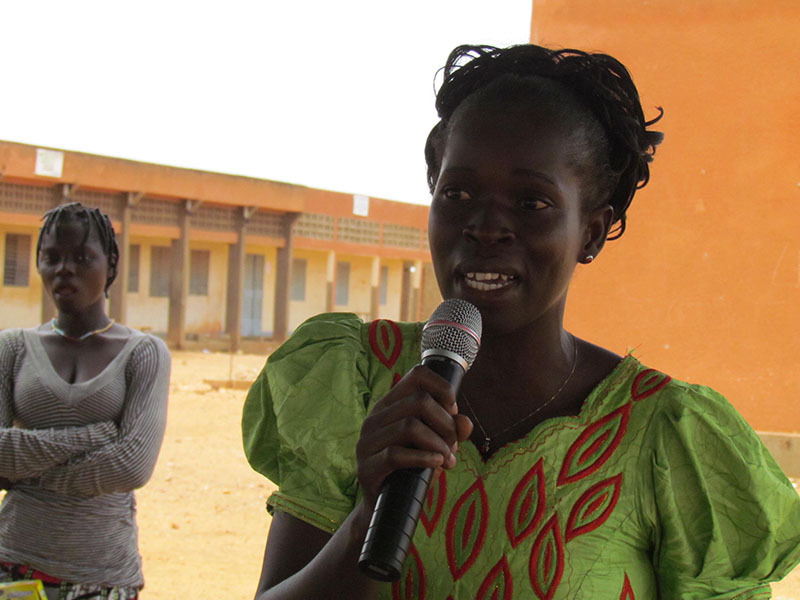 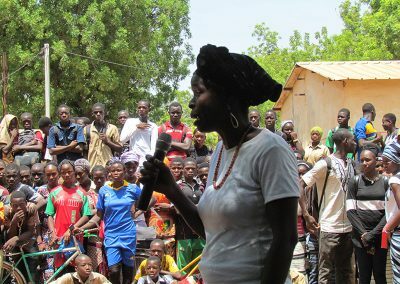 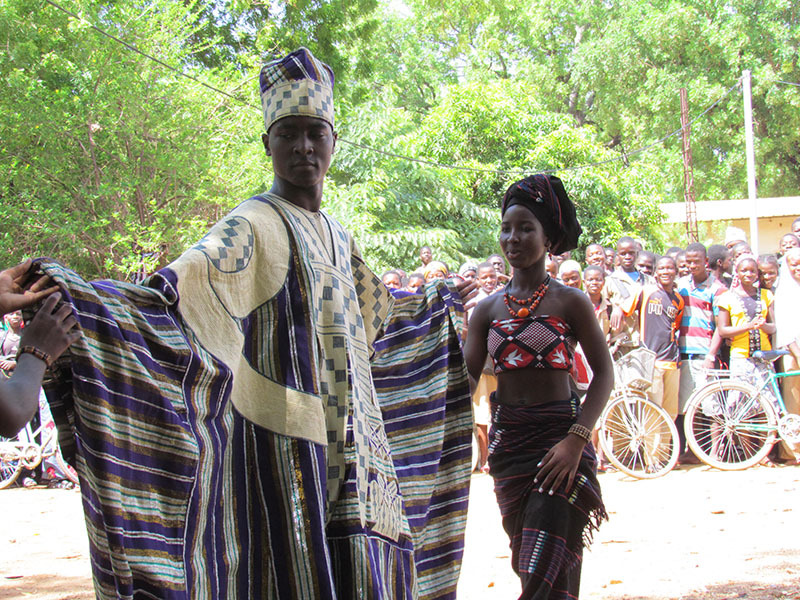 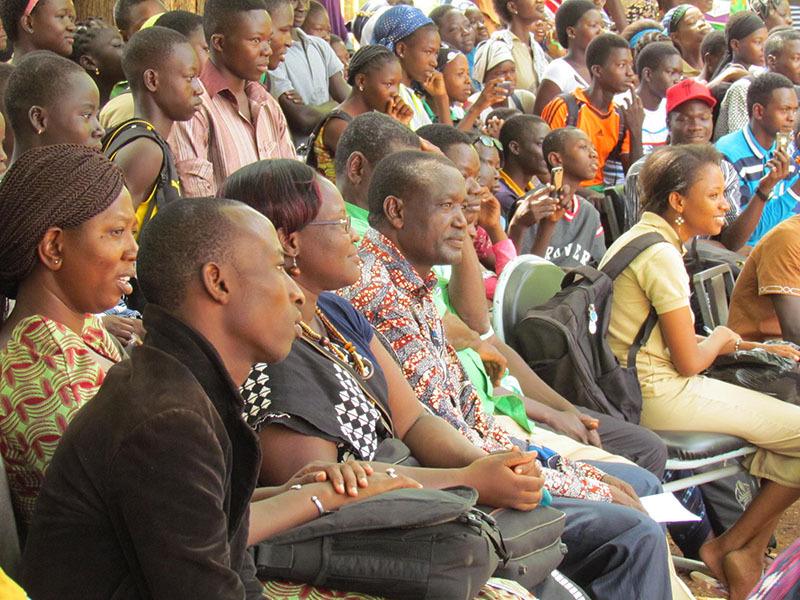 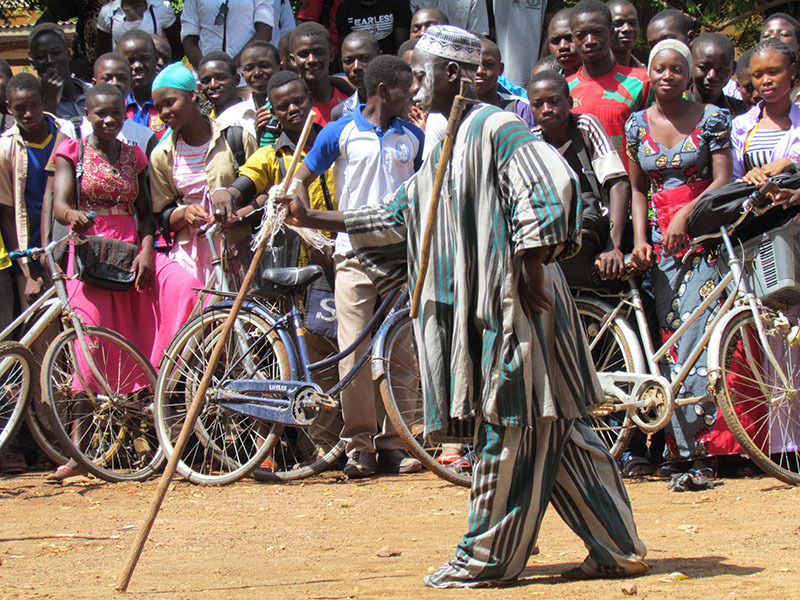 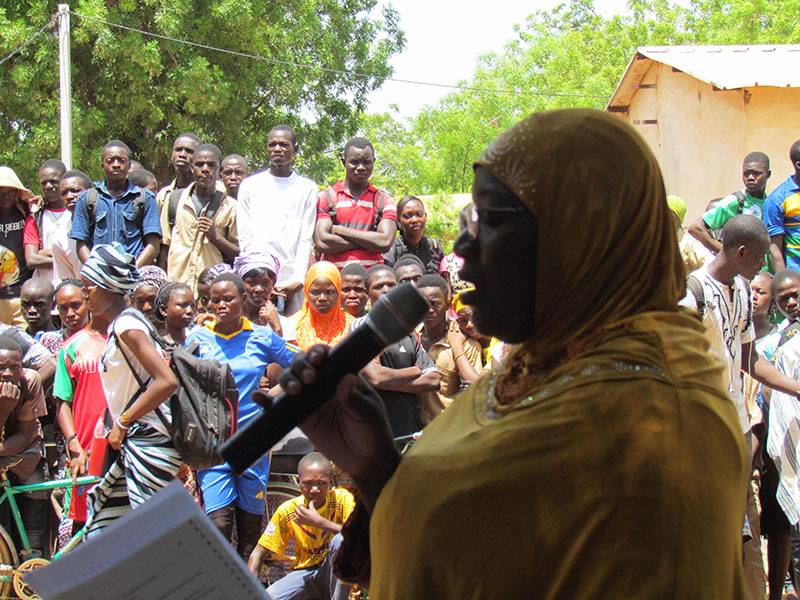 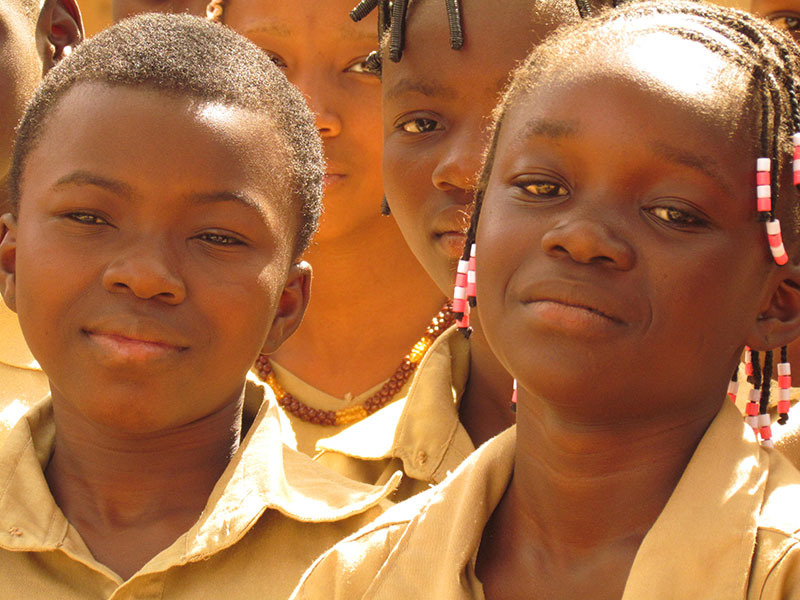 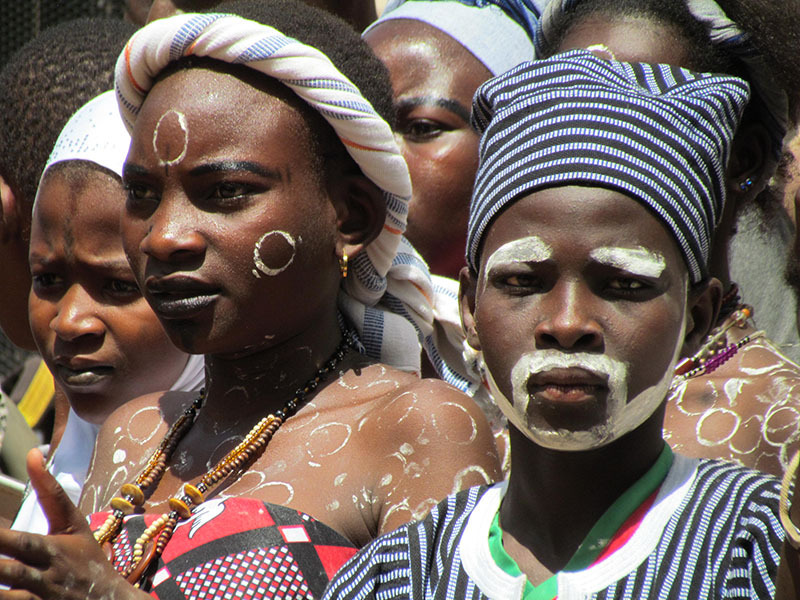 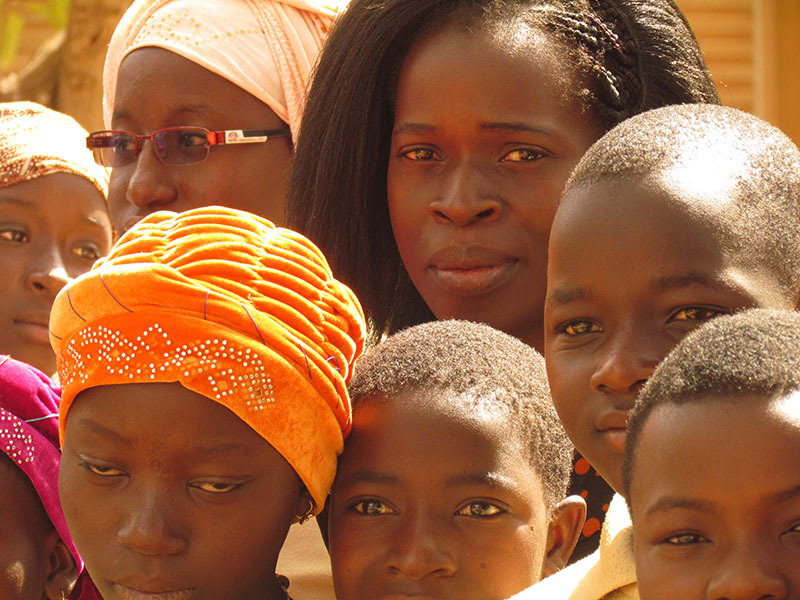 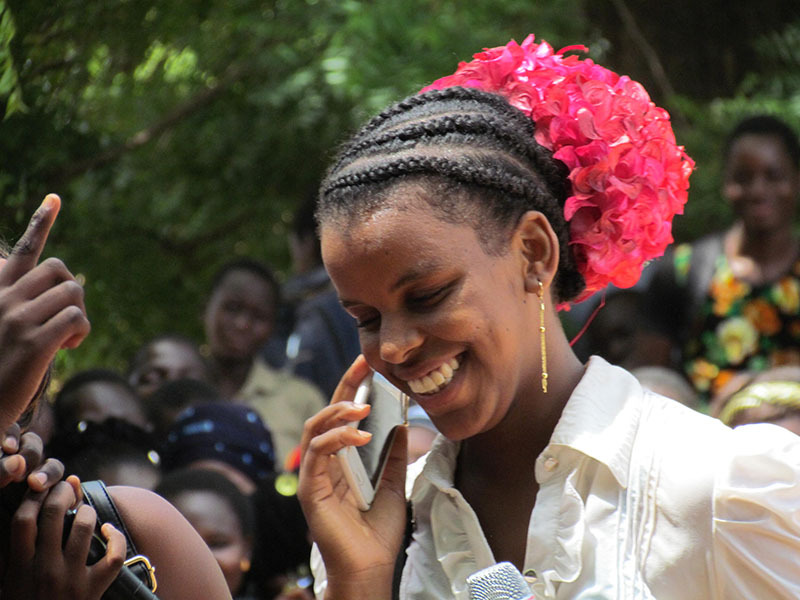 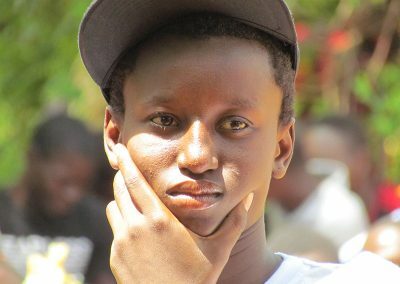 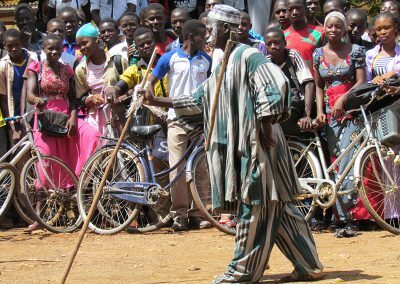 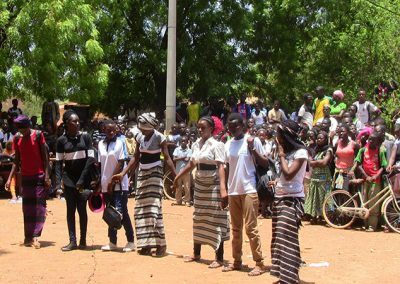 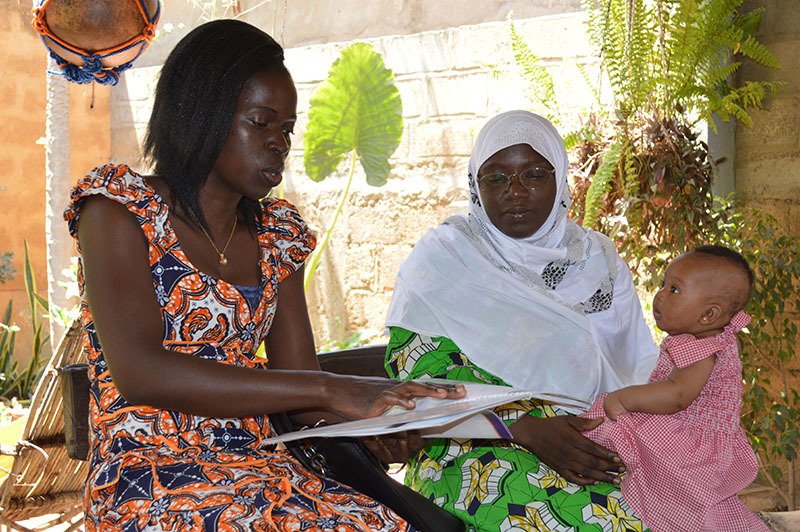 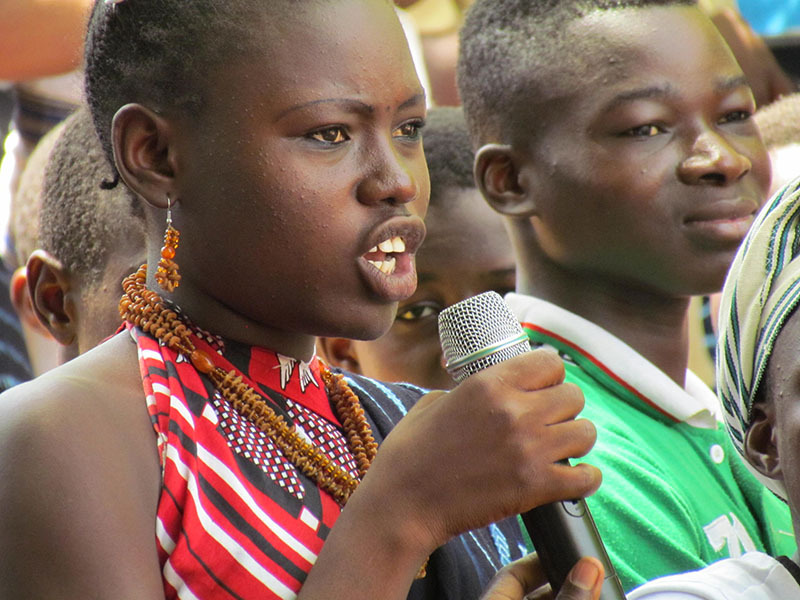 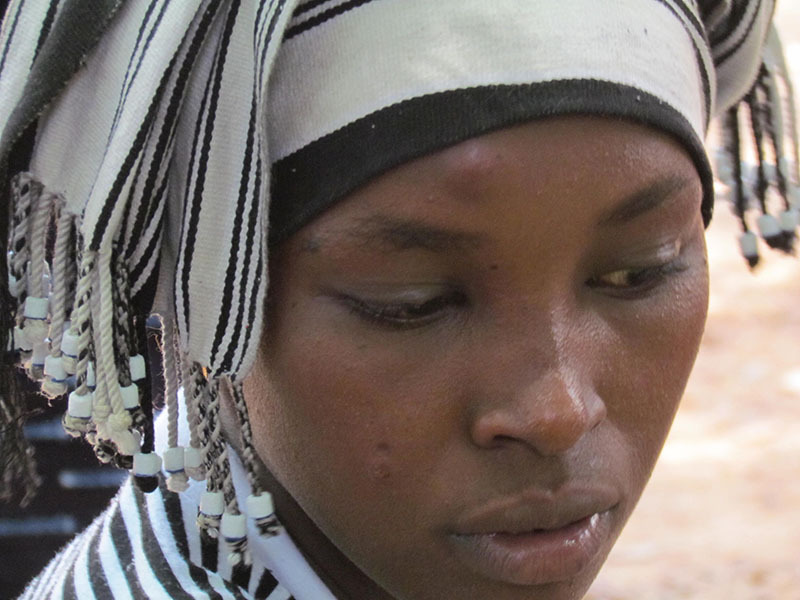 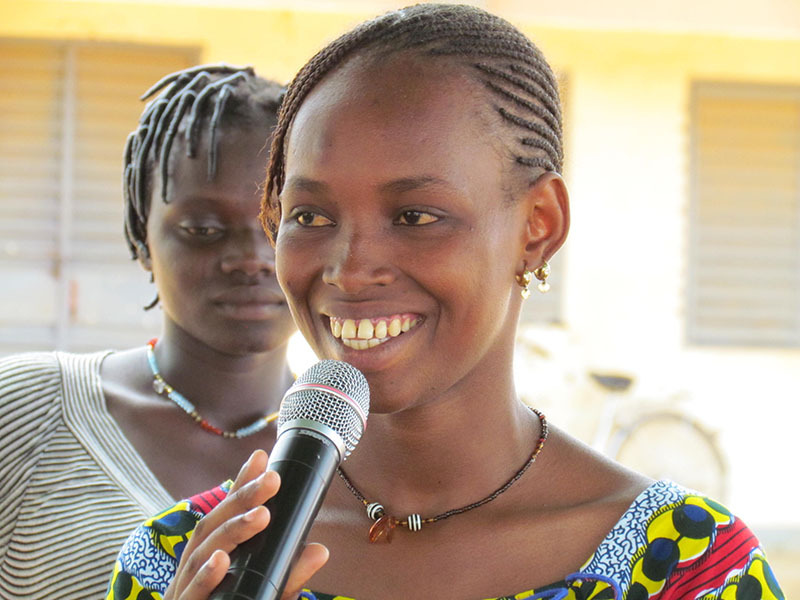 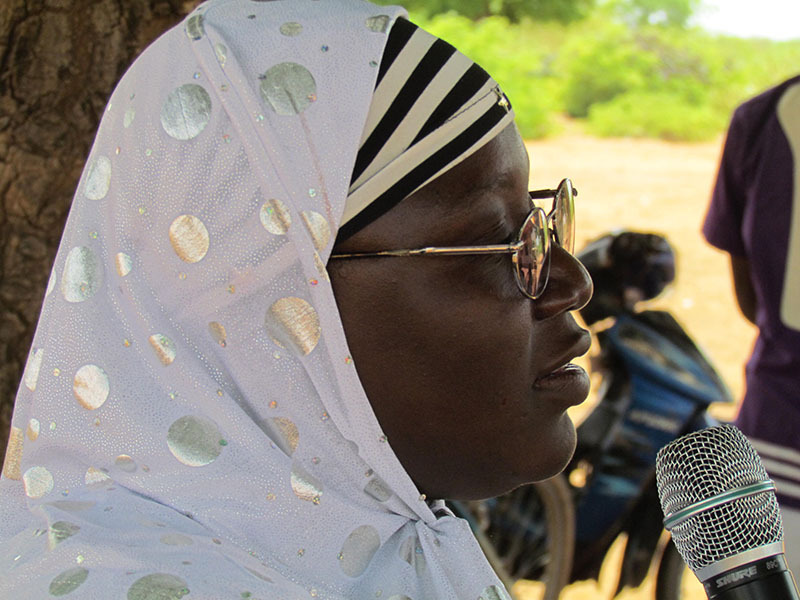 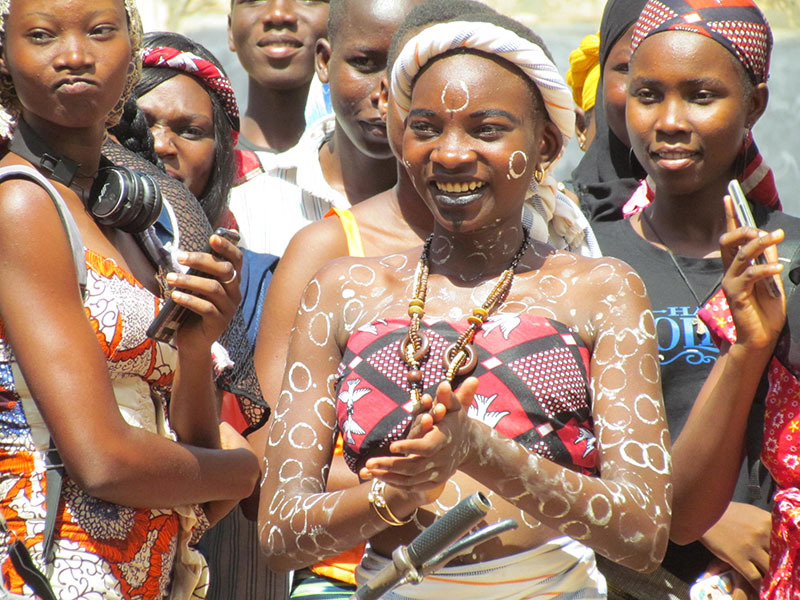 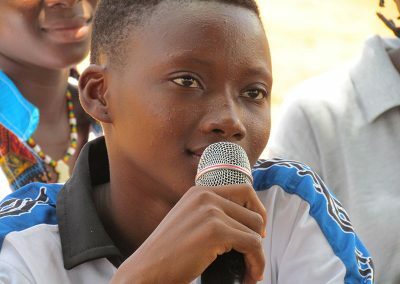 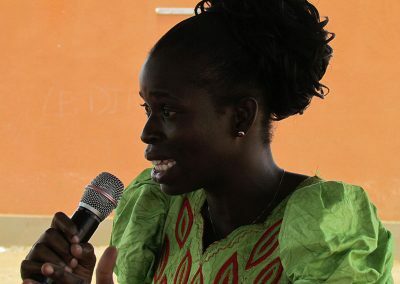 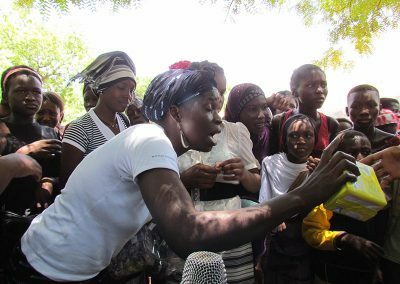 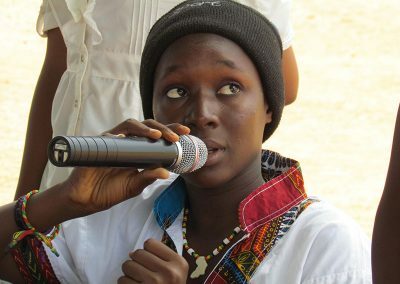 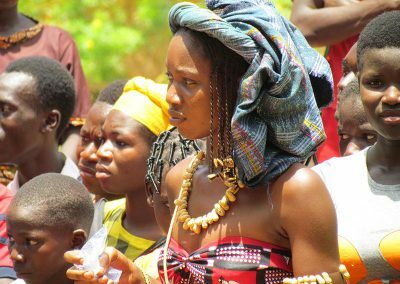 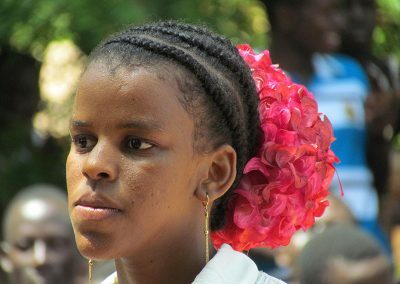 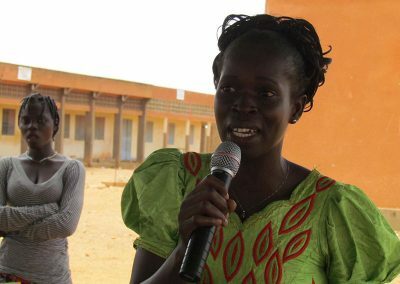 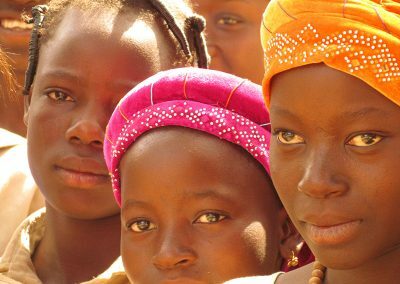 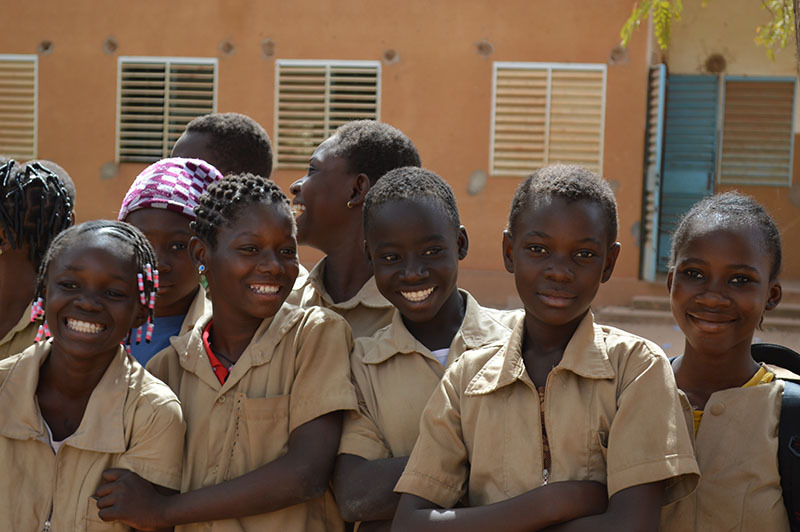 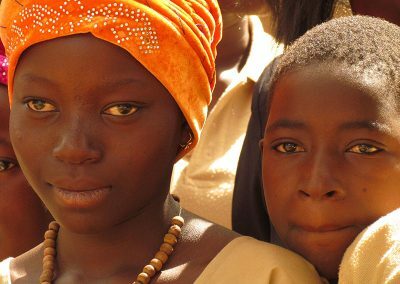 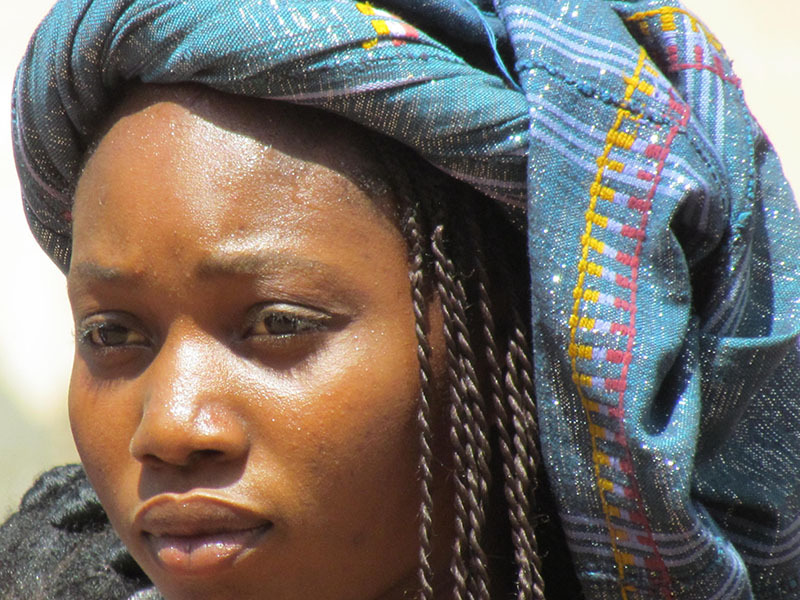 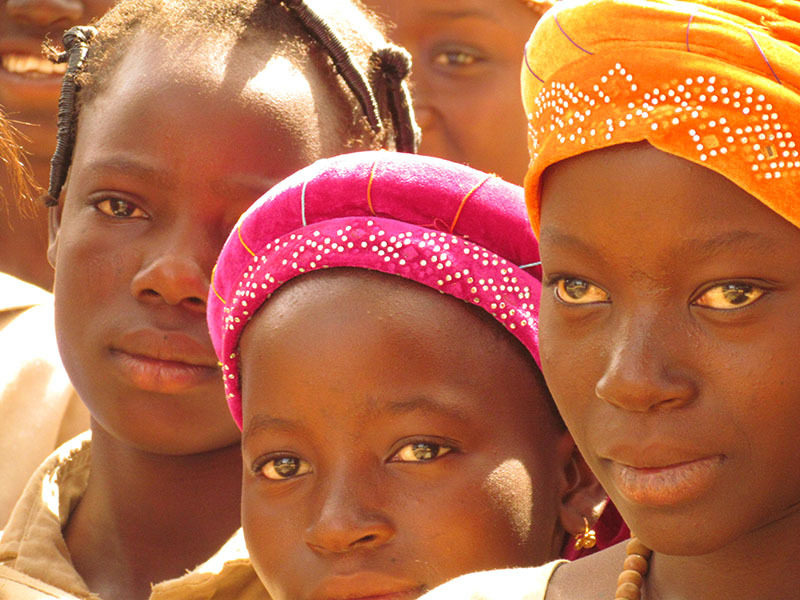 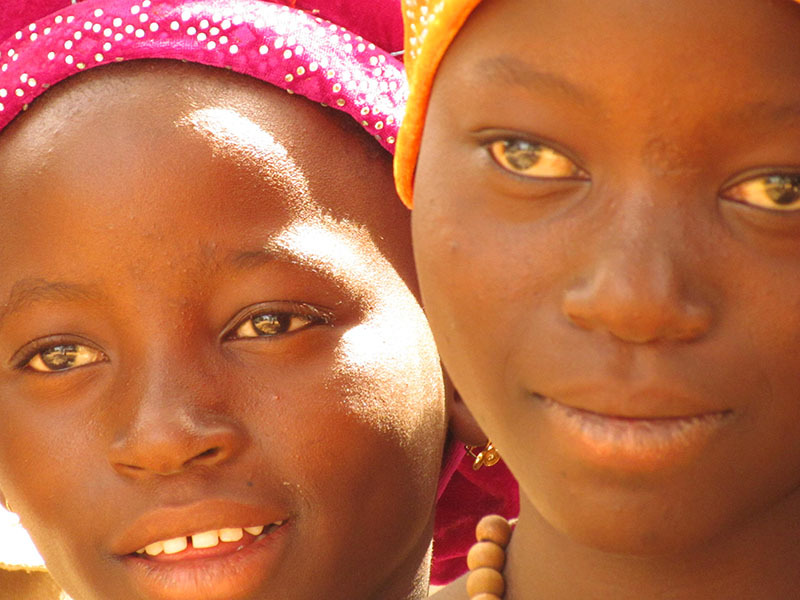 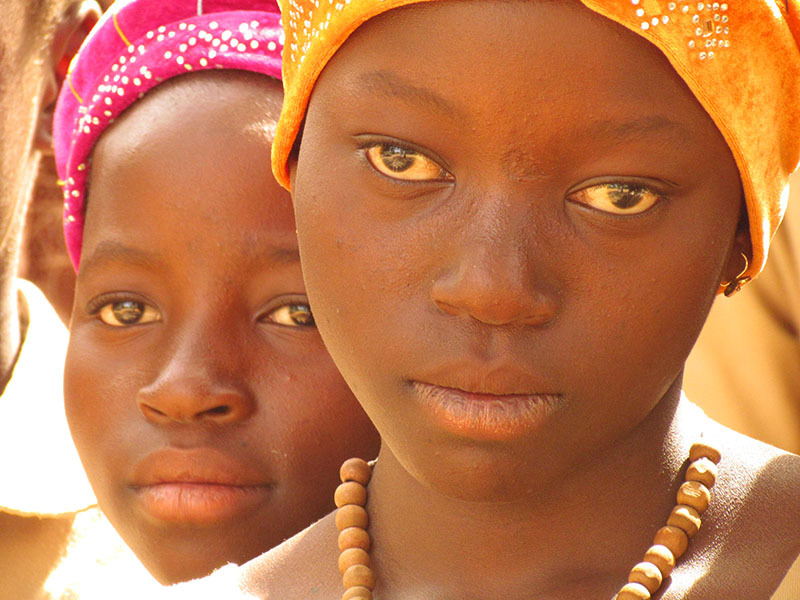 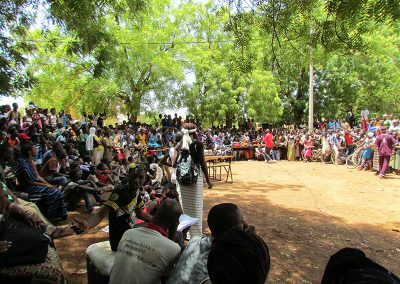 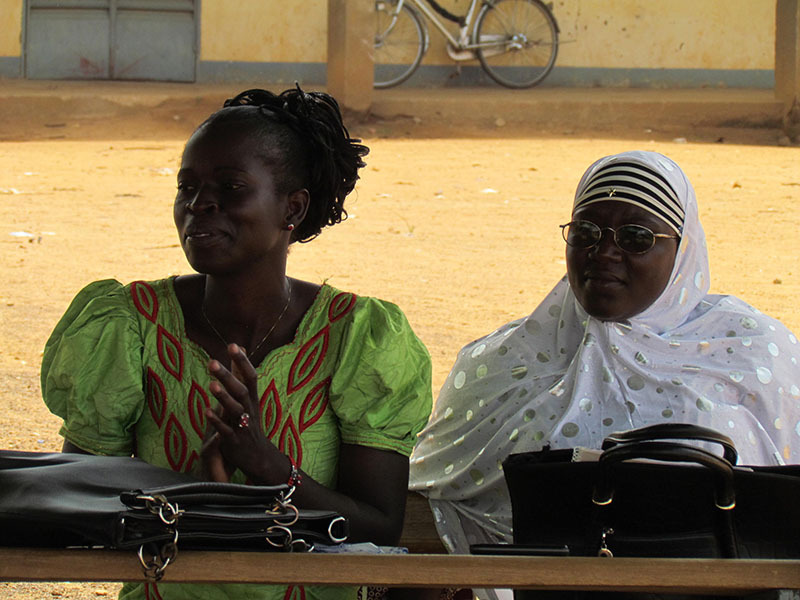 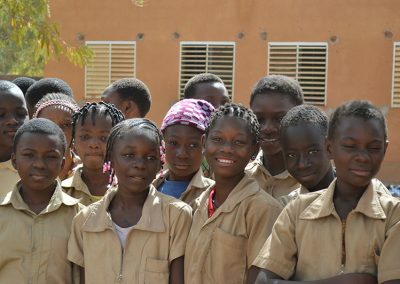 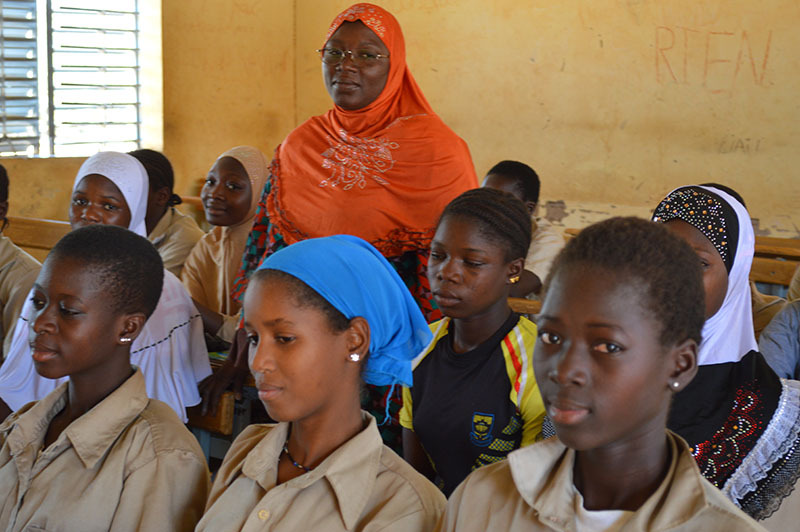 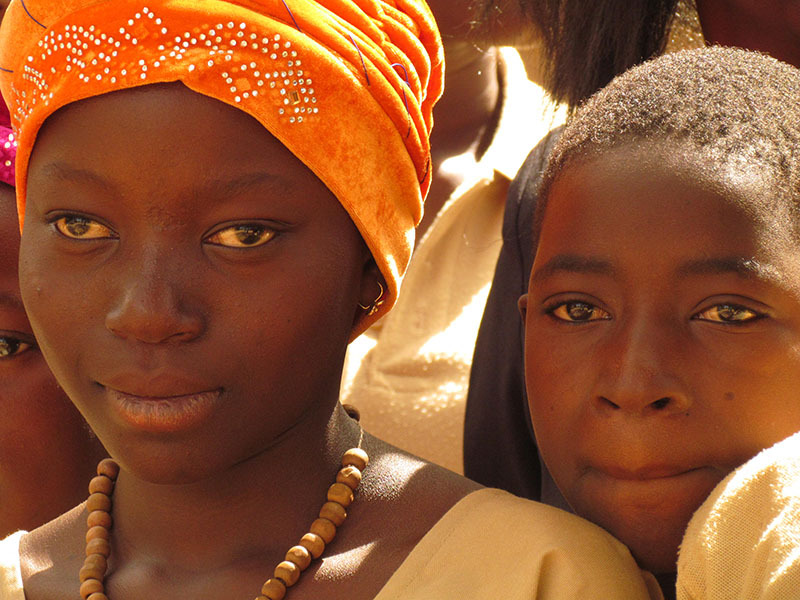 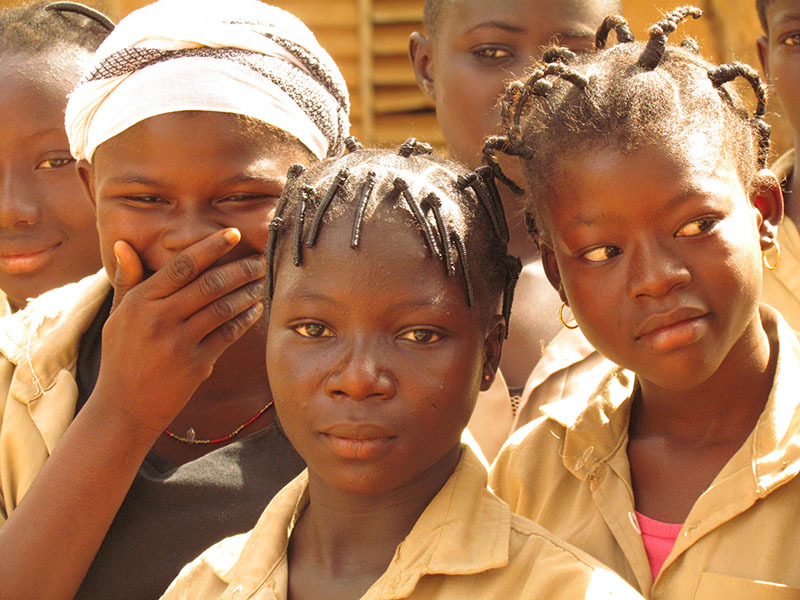 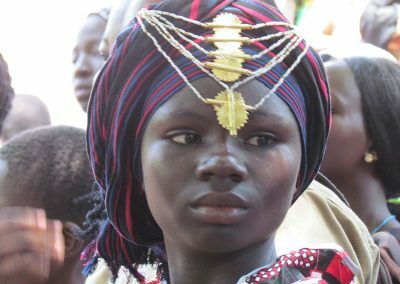 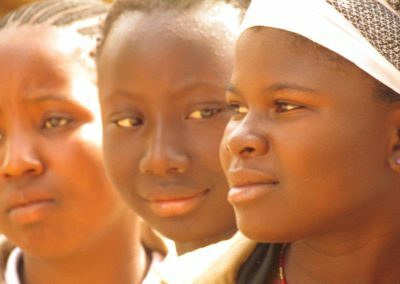 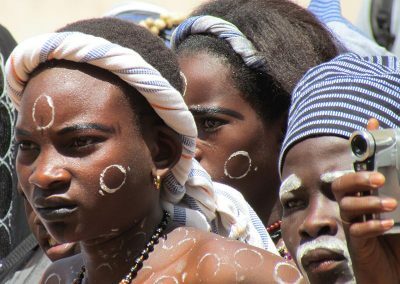 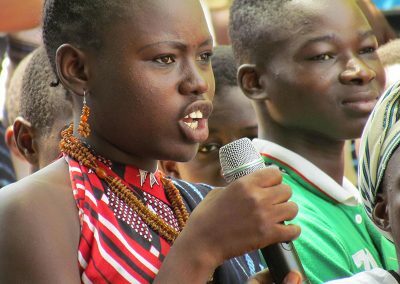 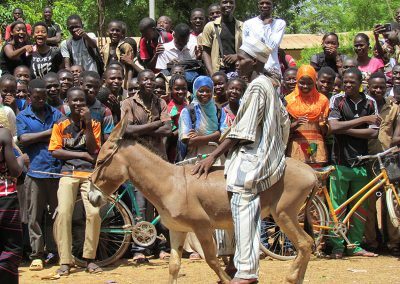 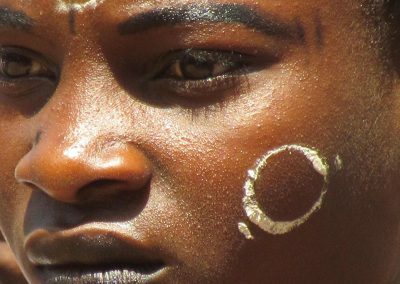 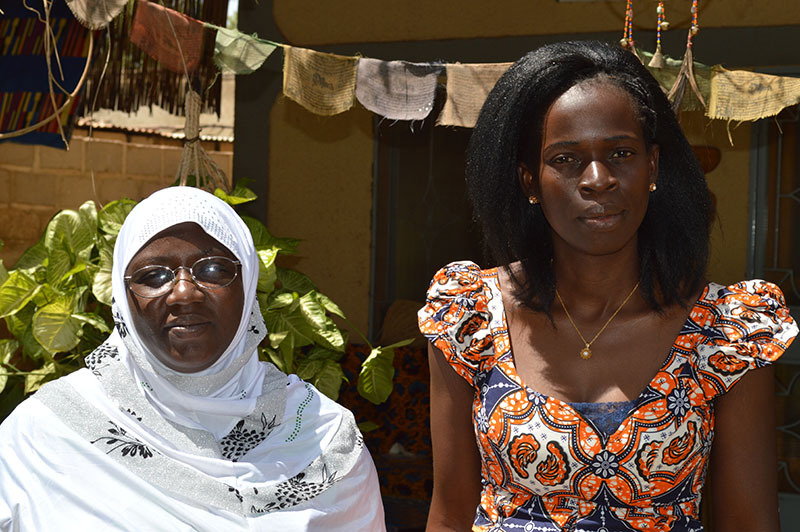 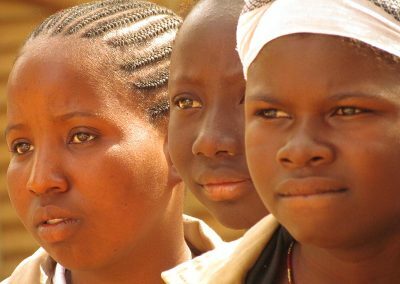 The subject of menstruation is taboo in Burkina Faso. 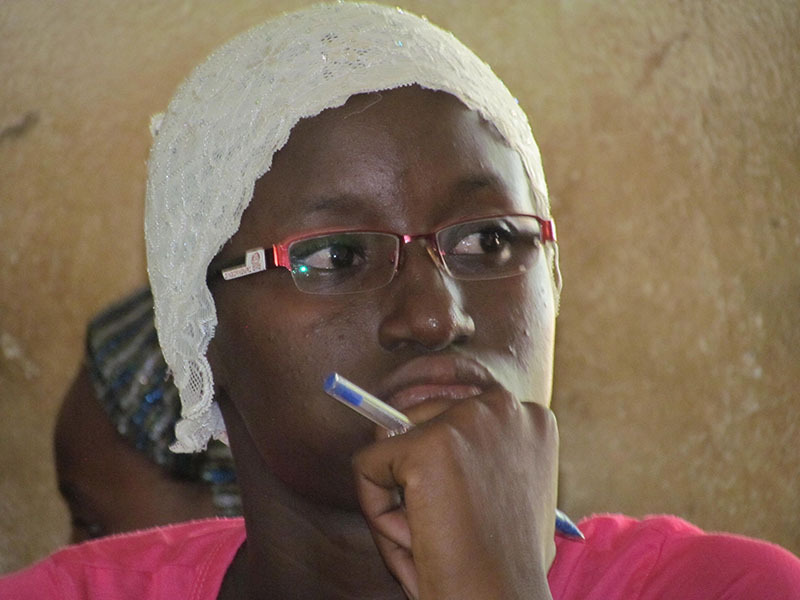 Girls are rarely informed prior to experiencing it. 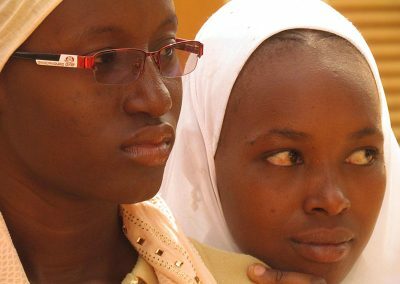 This lack of understanding and preparation can lead to embarrassing situations for girls causing alienation, isolation and shame– which can become so great, it can end a girl’s education. 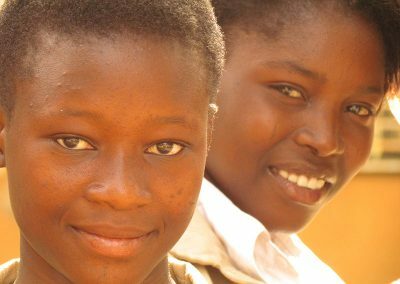 At best, many days of school are missed each month, making it hard for girls to excel in classes, play sports, or even just feel at ease. 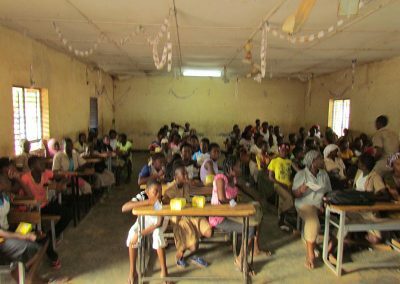 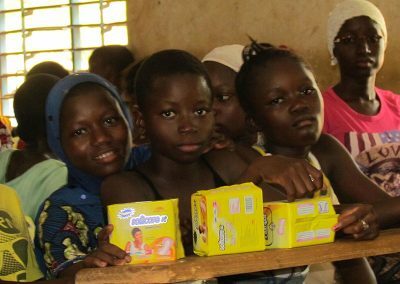 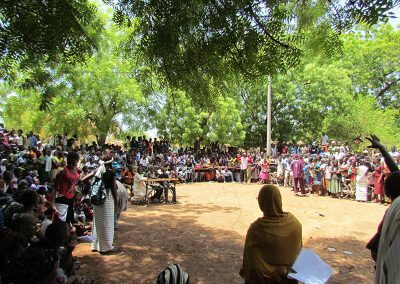 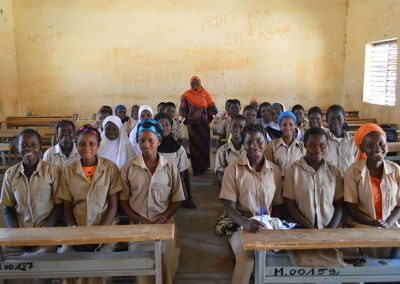 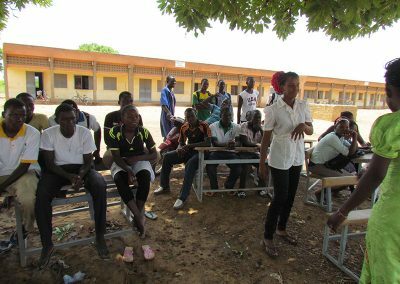 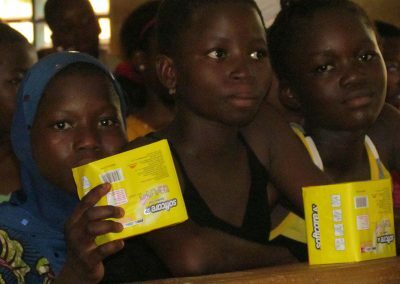 “Menstrual Hygiene Management” is an important issue BARKA is integrating into its hygiene education programs in local schools. 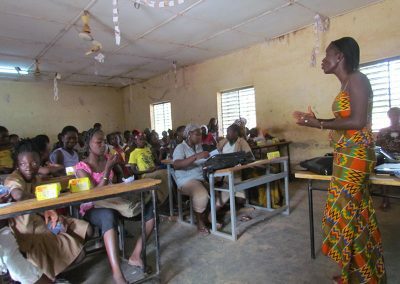 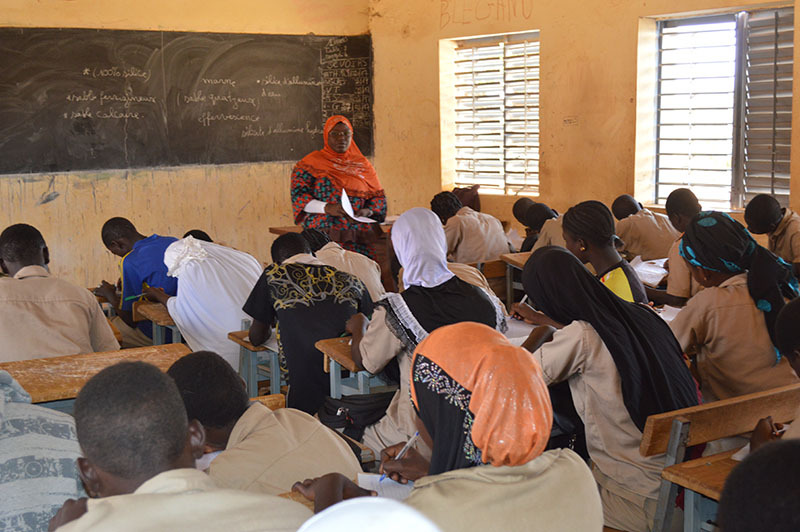 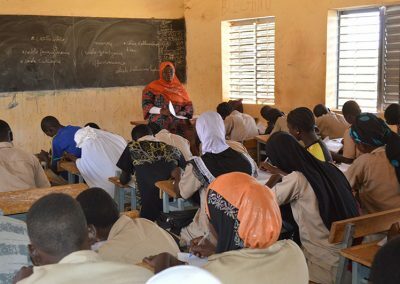 Thankfully, we are working with two phenomenal UNICEF-trained, local female teachers in Fada’s two biggest high schools to create a massive awareness campaign for girls, boys, parents and teachers. 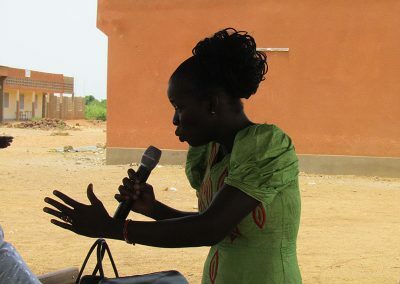 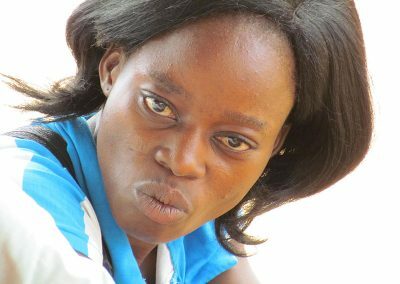 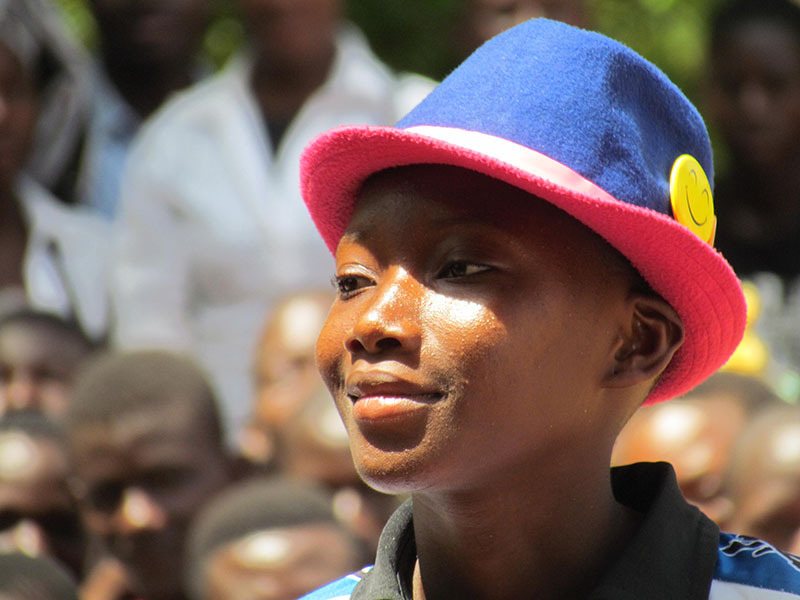 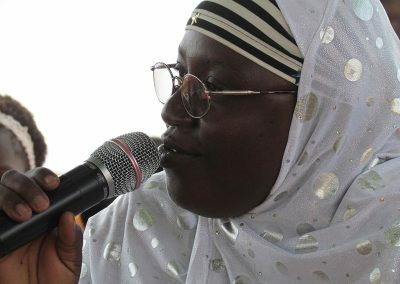 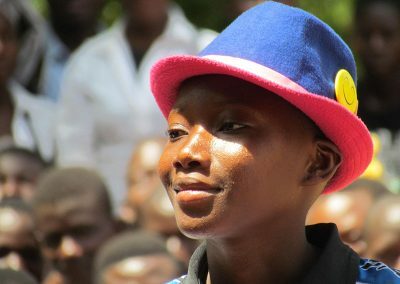 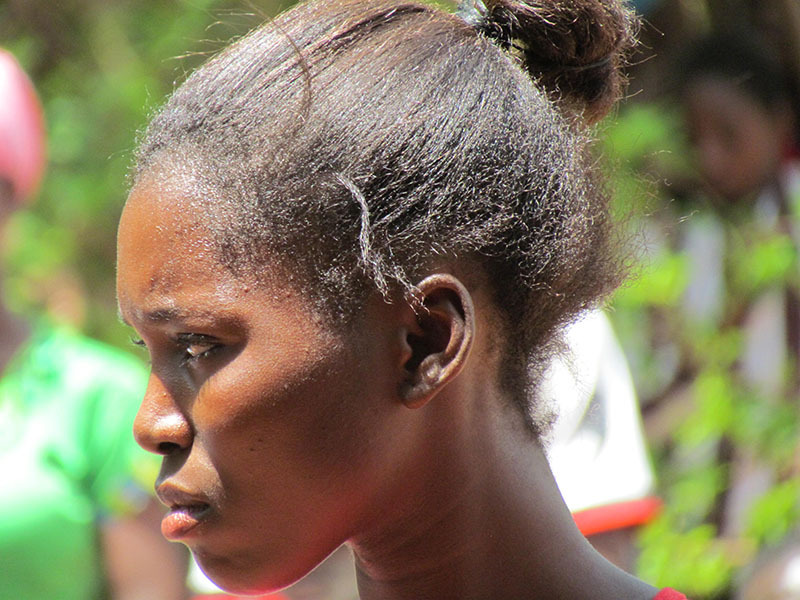 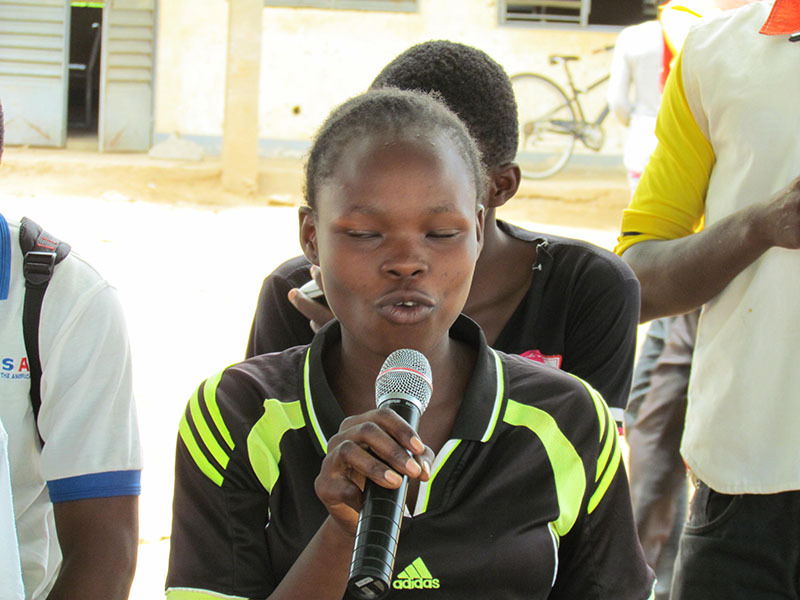 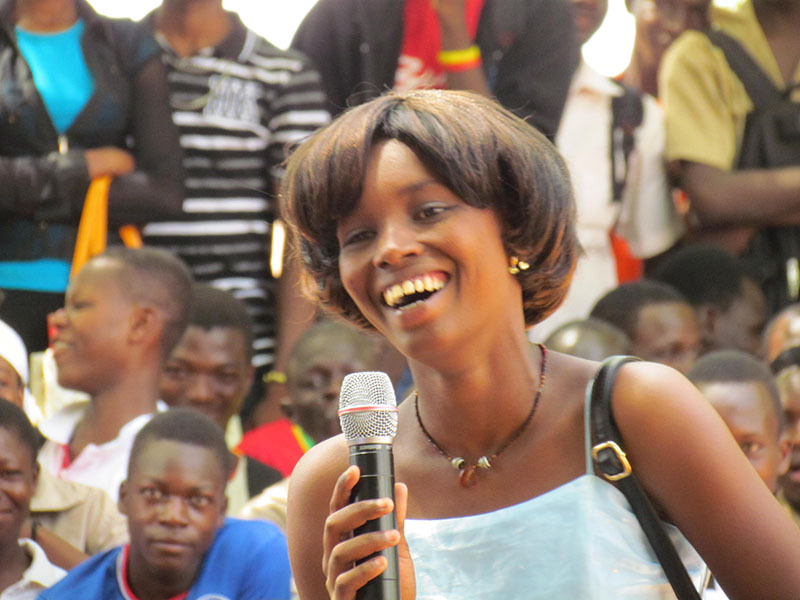 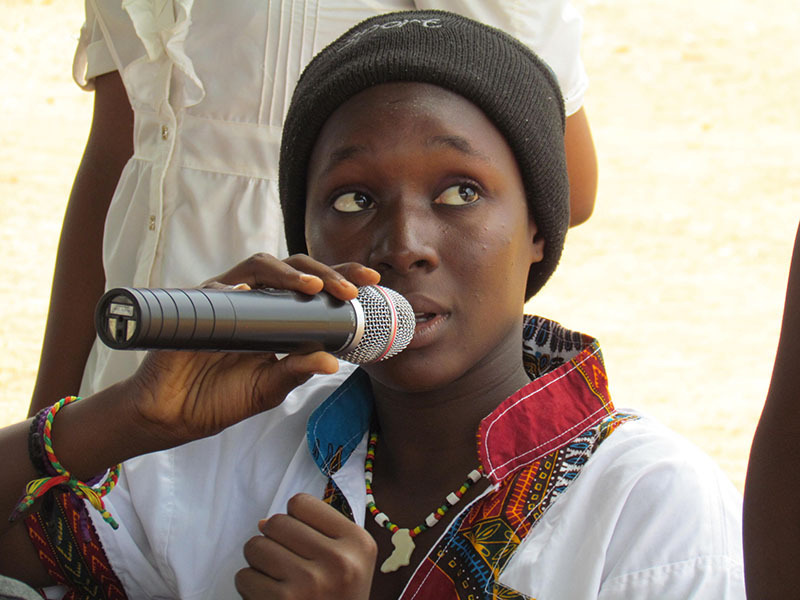 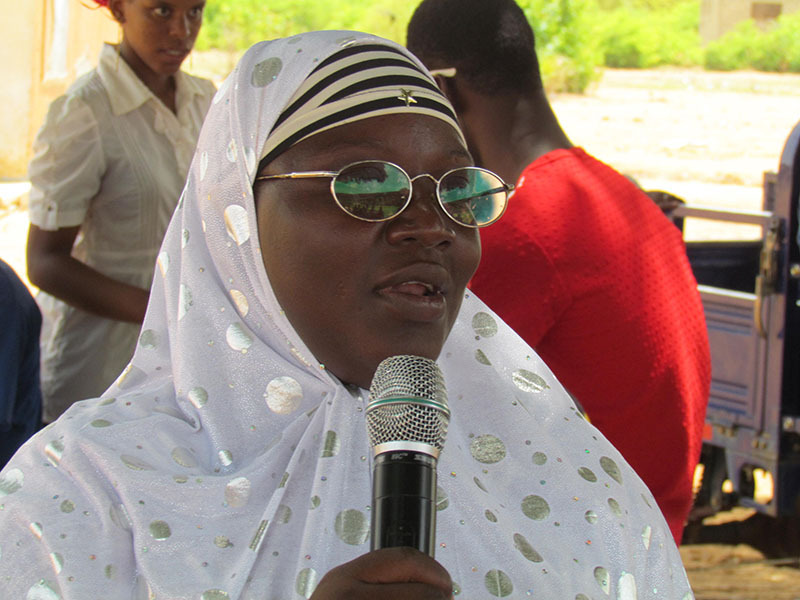 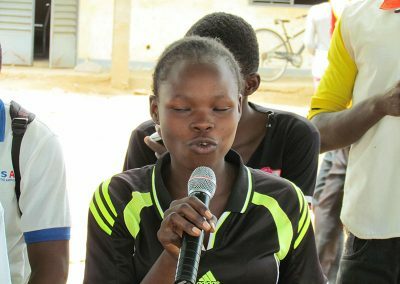 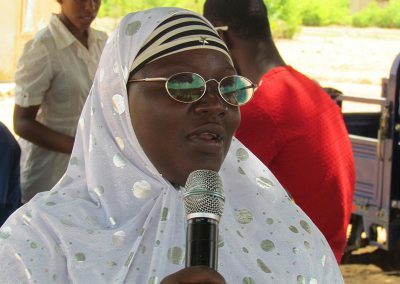 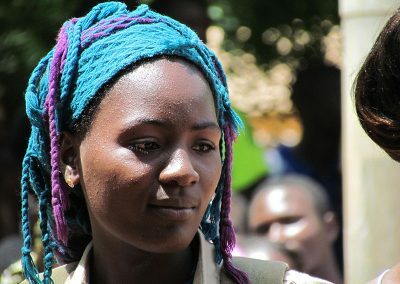 A high school girl during a sensitization training. Madame Zalle adresses her students. 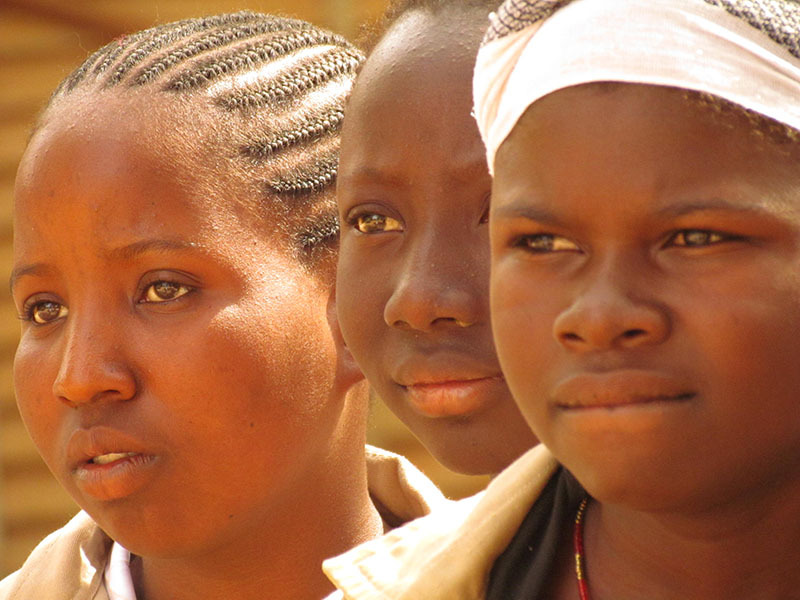 Madame Zalle and her girls. Girls from Lycee Communal de Fada. 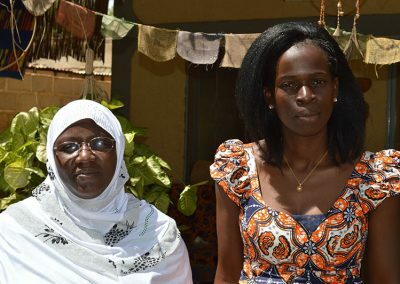 Madame Zalle, Martine and Ina. Discussing Phase 1 of BARKA’s MHM project with project leaders. 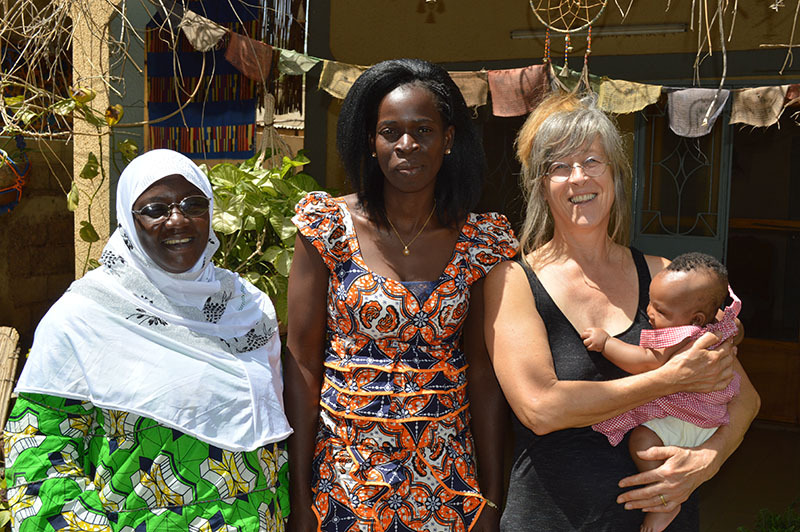 Martine, Madame Zalle and her newborn daughter. 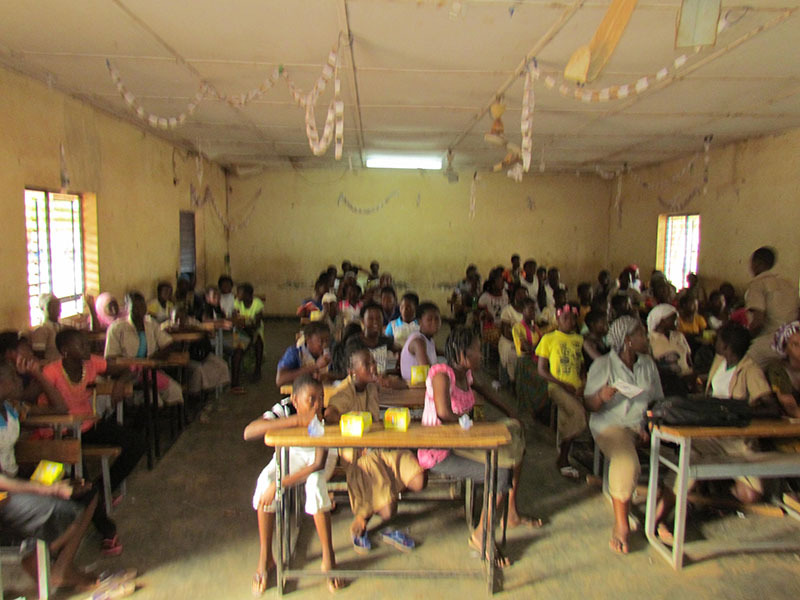 The “Awakening Girls Club” of Lycee Diaba Lompo. 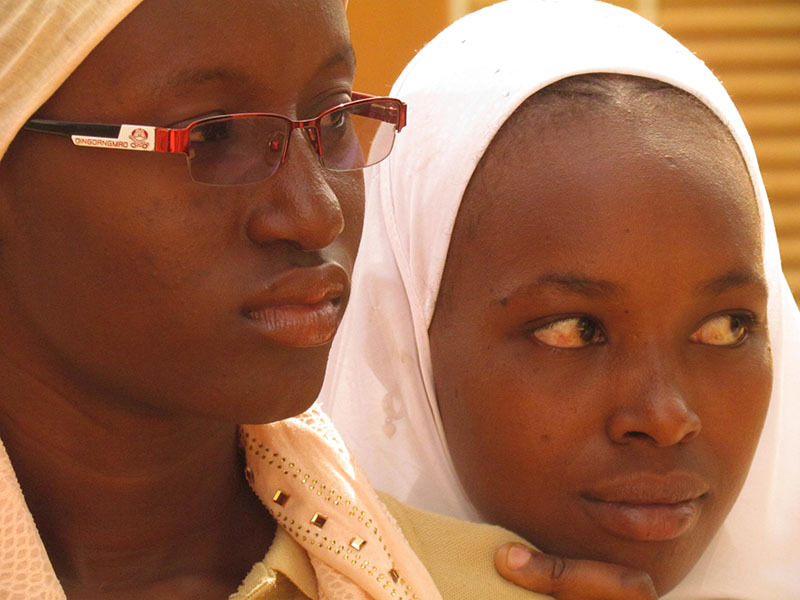 These girls are in the process of understanding how powerful they are. 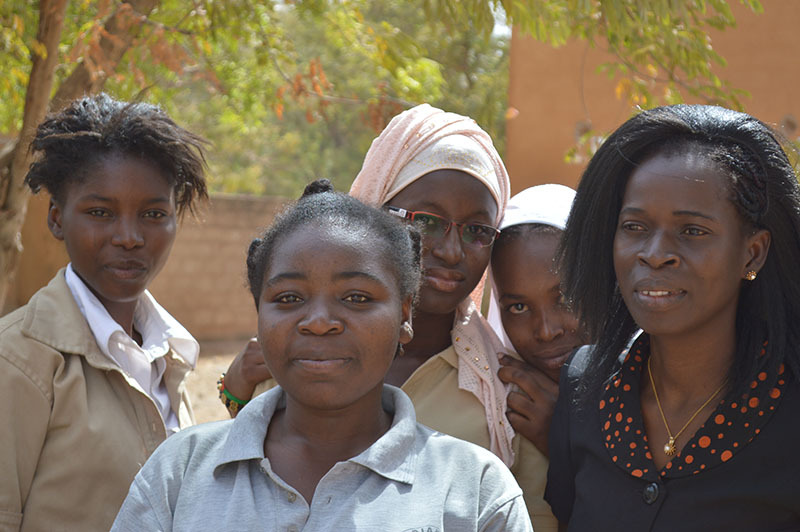 Martine and the Club of Awakening Girls. 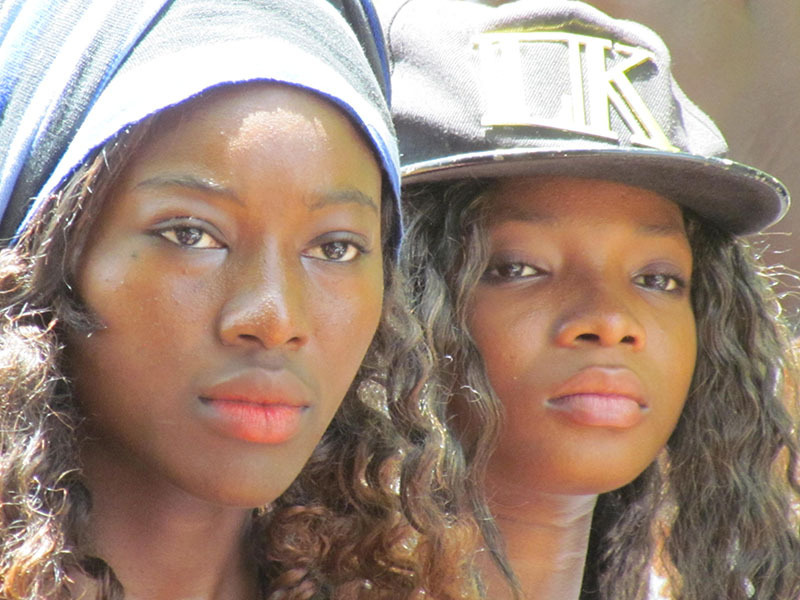 Older girls from the Club of Awakening Girls. 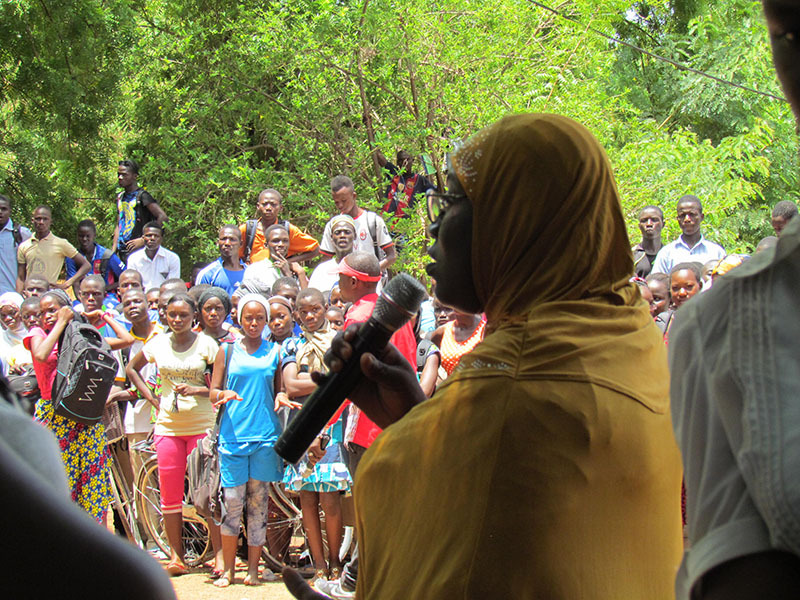 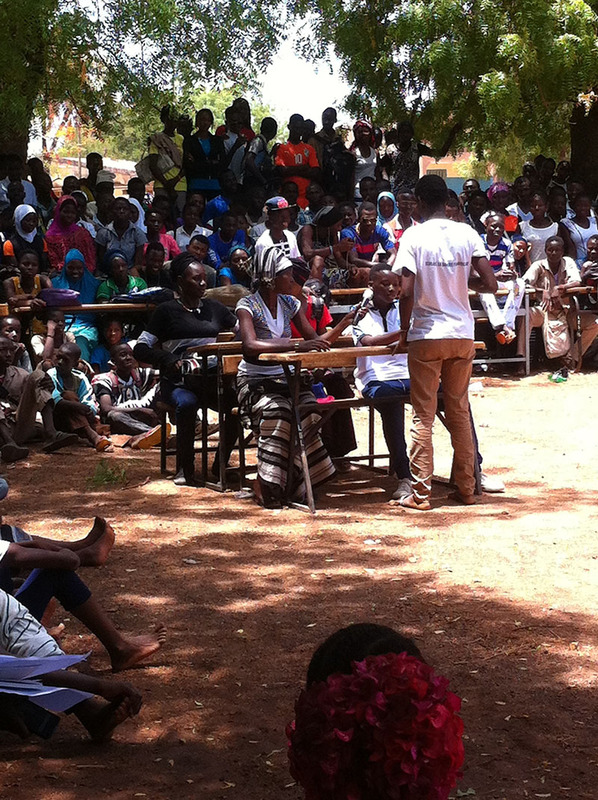 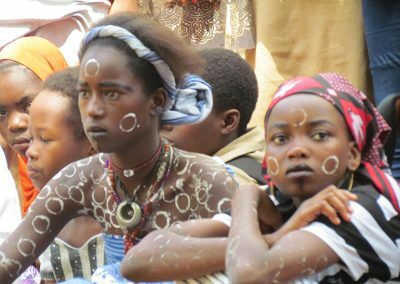 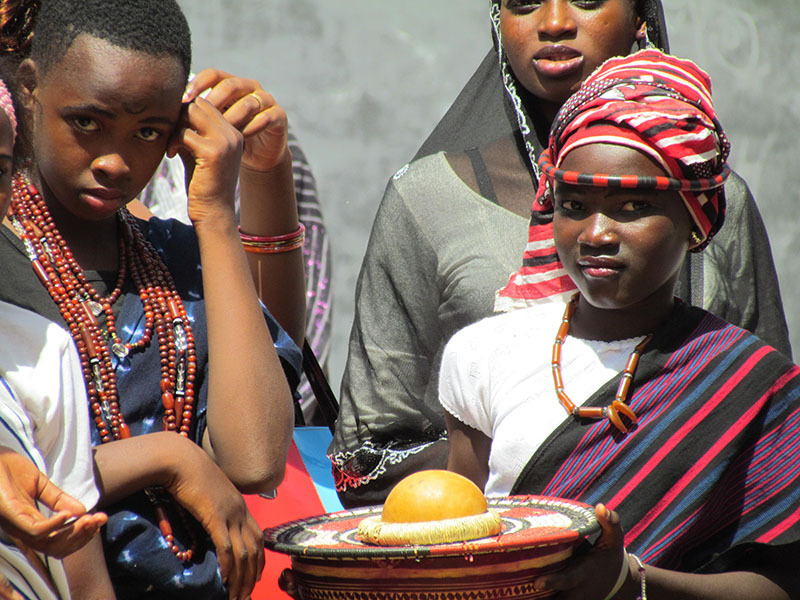 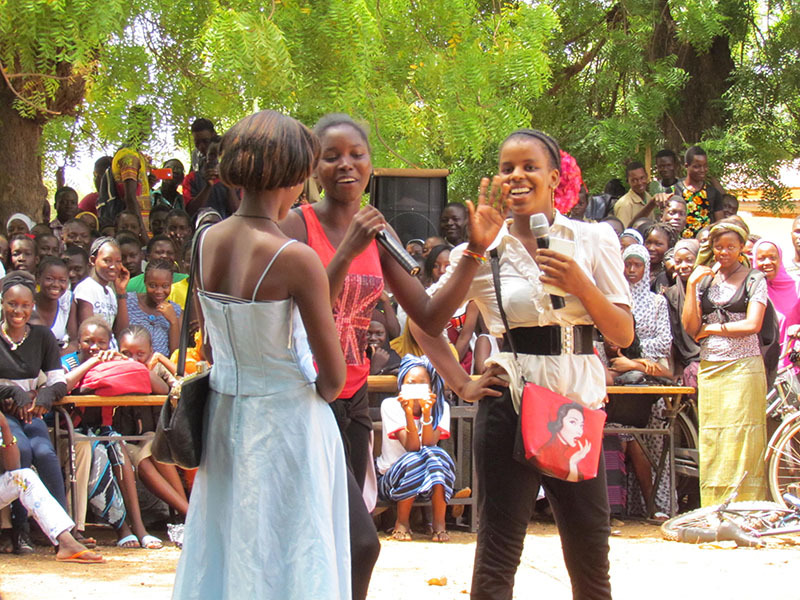 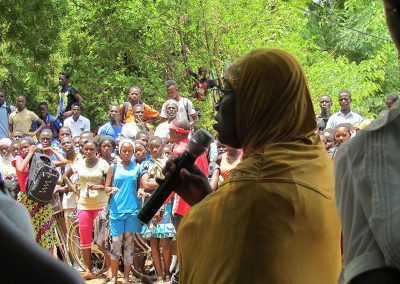 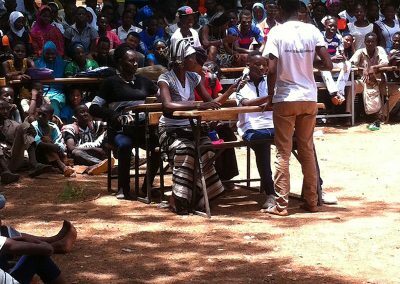 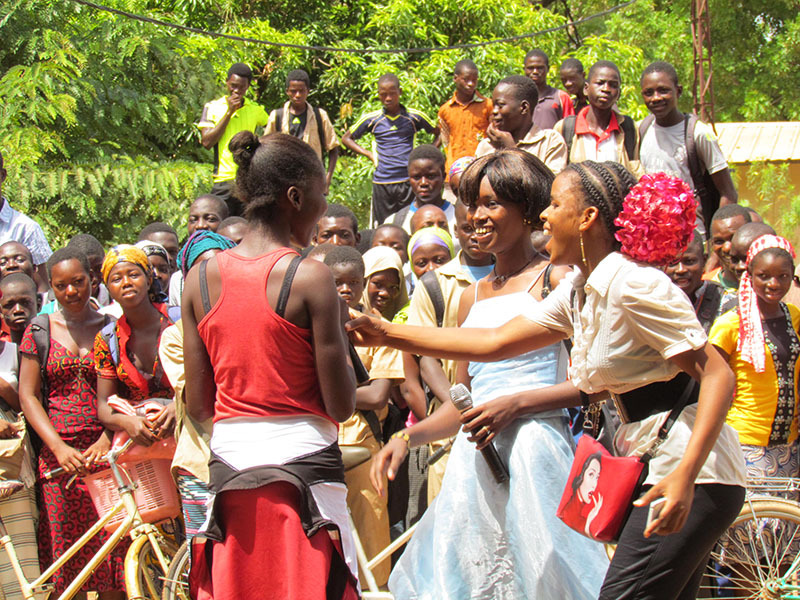 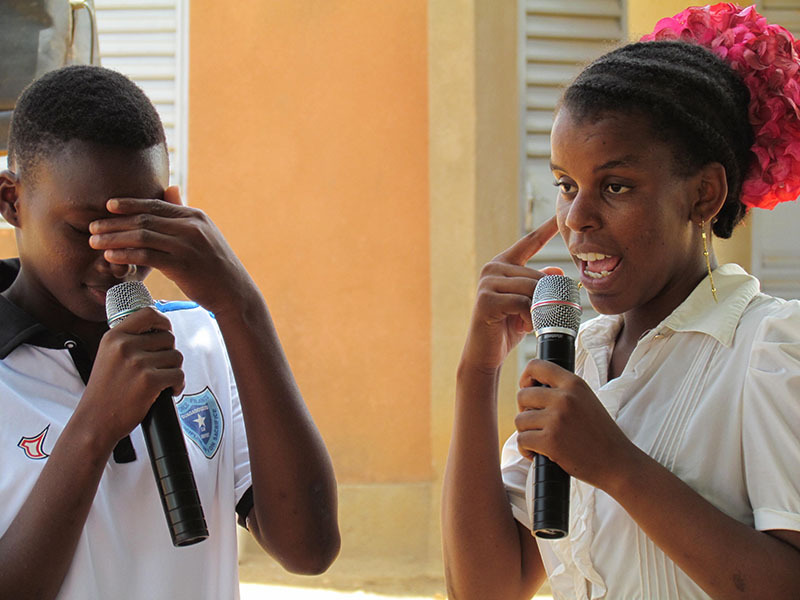 These girls created skits to sensitize 1500 students about MHM and Female Genital Mutilation and Cutting (FGMC). 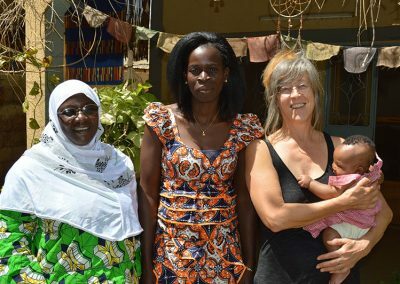 Martine and the leaders of the MHM Club. 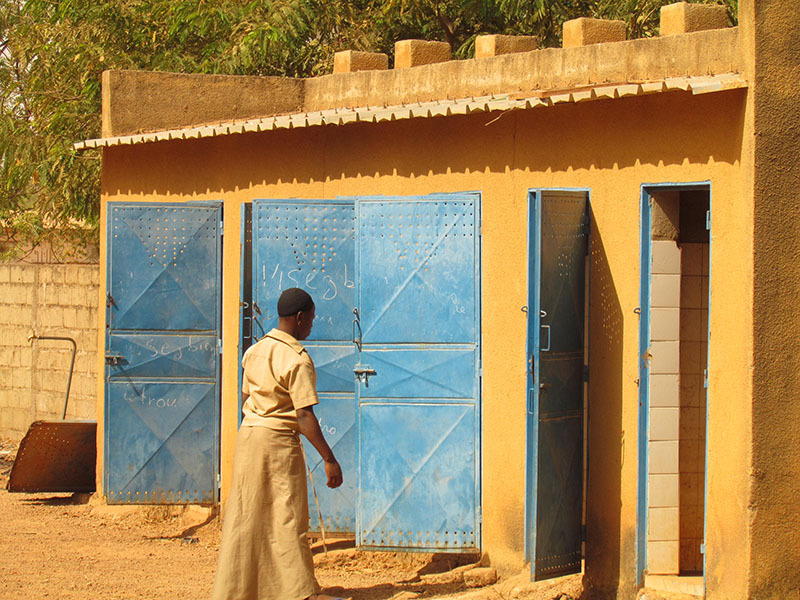 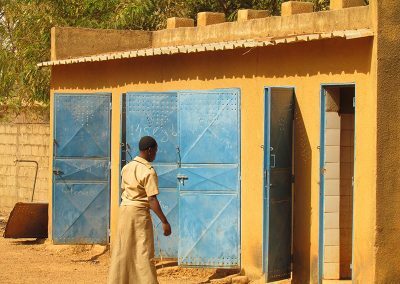 This is the latrine students use at Lycee Diaba Lompo, Fada’s largest high school. 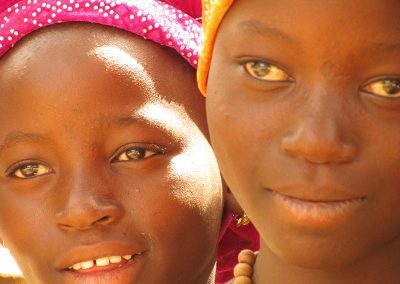 These girls know that girls are powerful. The president of the club of Awakening Girls with Club founder and advisor Martine. 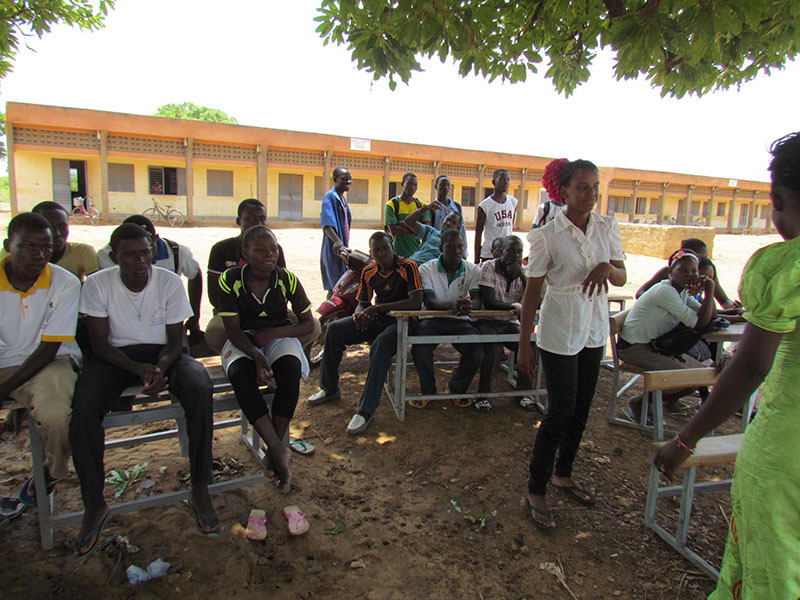 Madame Zalle leading a sensitization training after school. 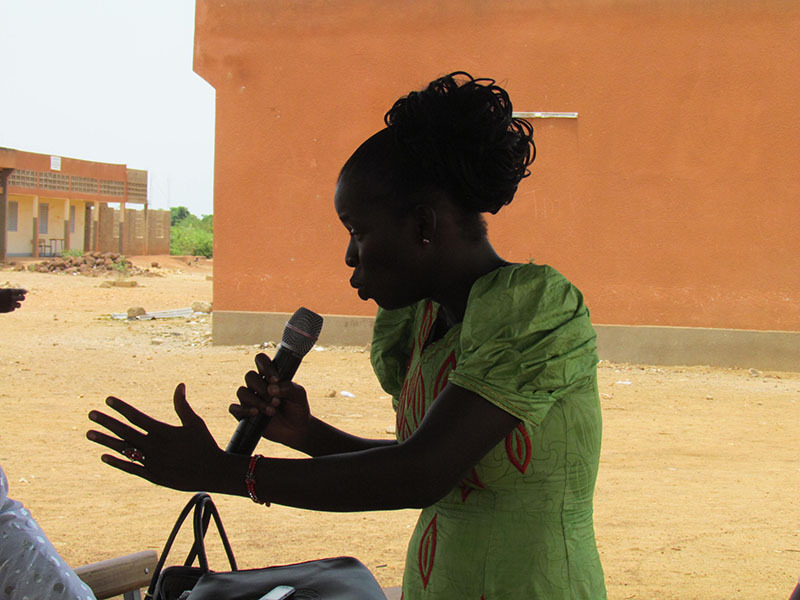 Martine providing facts about menstruation. 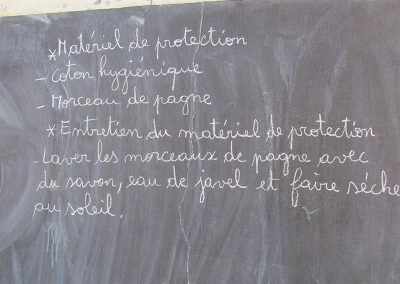 Translation: Menstruation is also known as the period. 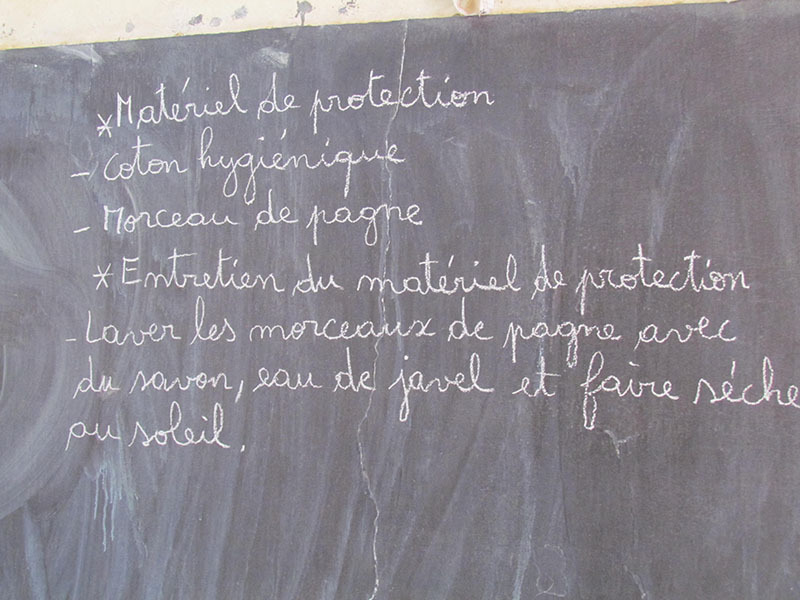 The rules of hygienic management of menstruation. Girls received sanitary pads during training sessions. 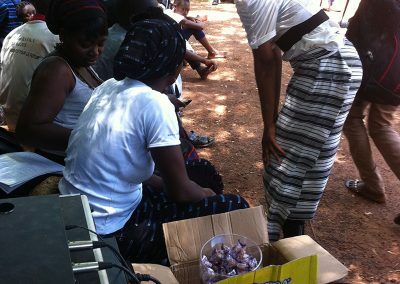 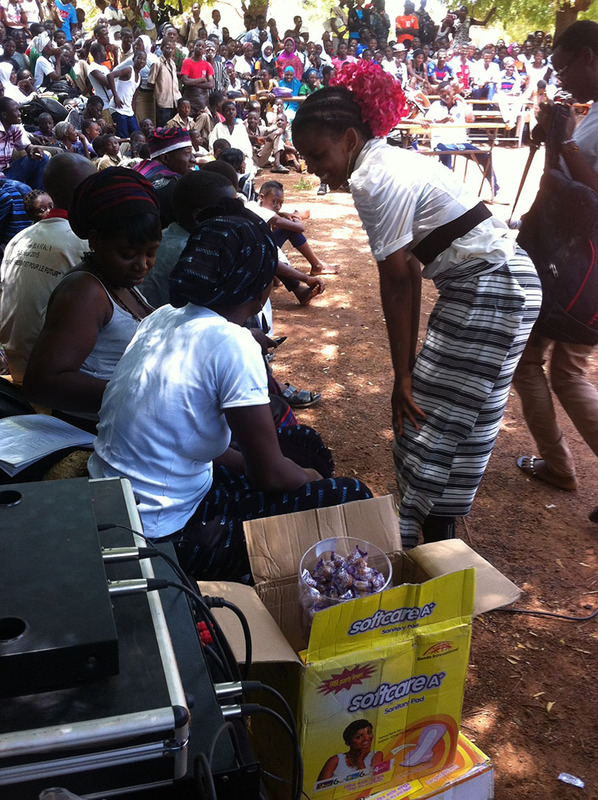 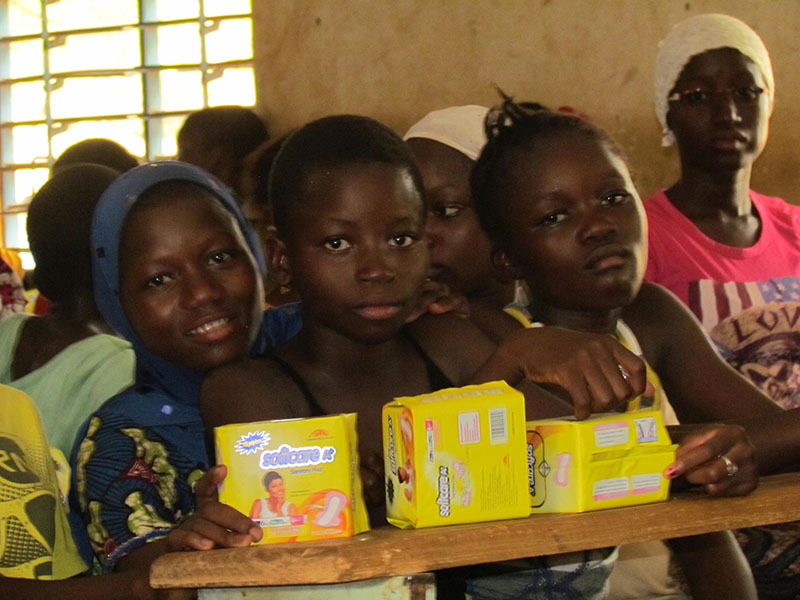 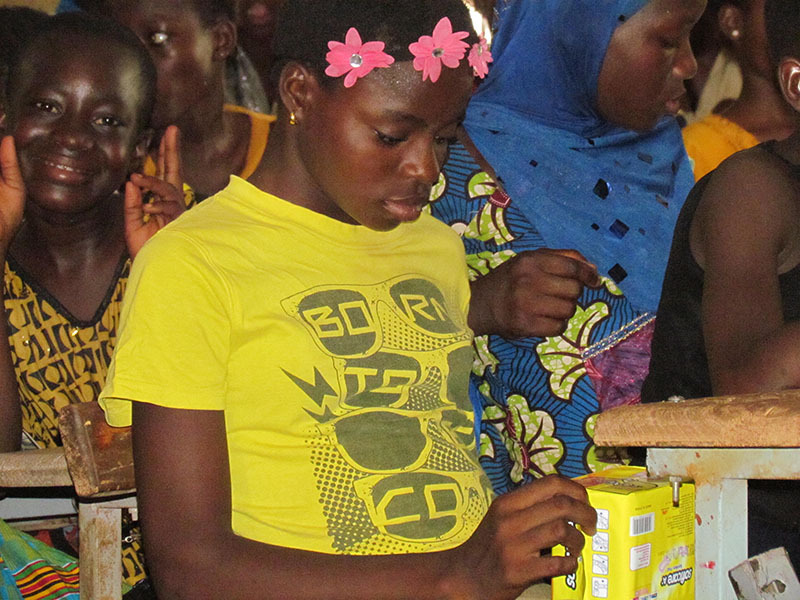 Pads are expensive in Burkina; this was the first time most girls received any. 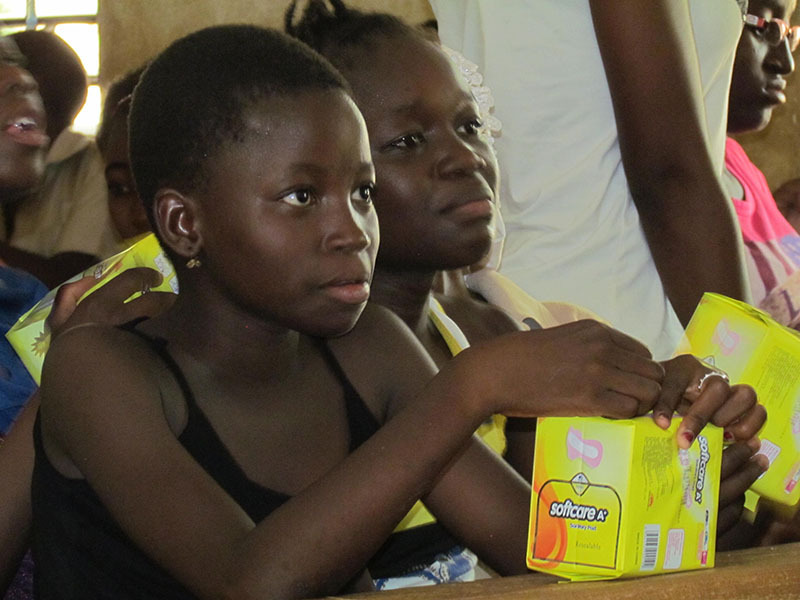 Girls were trained on how to properly use sanitary pads. 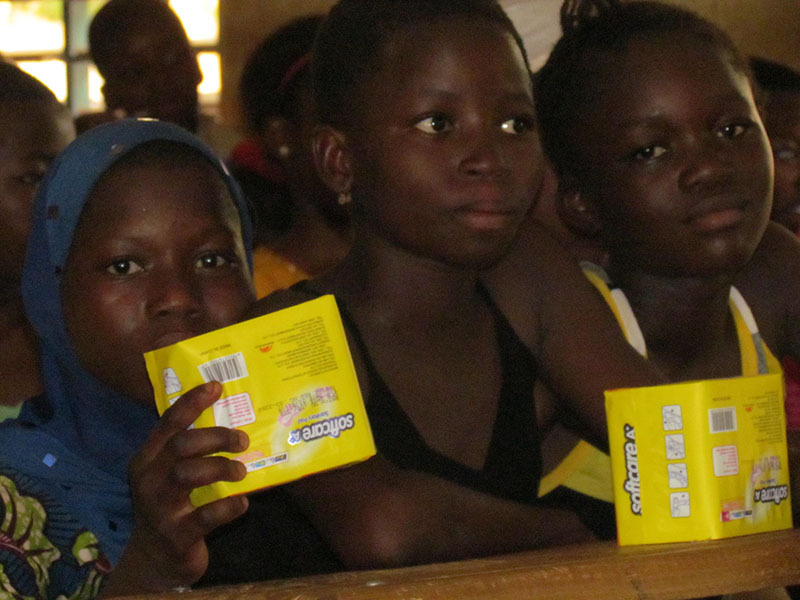 The pads were highly sought after and appreciated. Martine demonstrates how to use the pads. 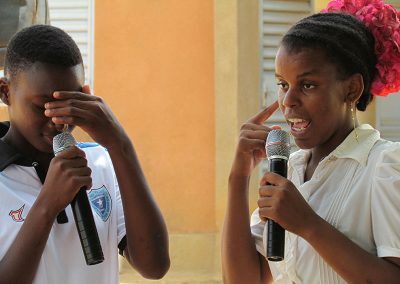 An older student trys her hand at it. 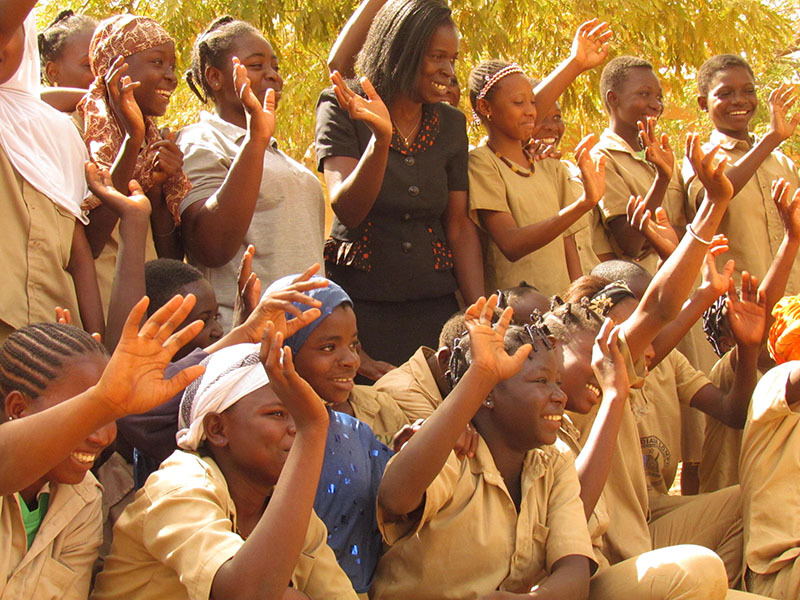 Girls and project leaders strike a pose after the training. 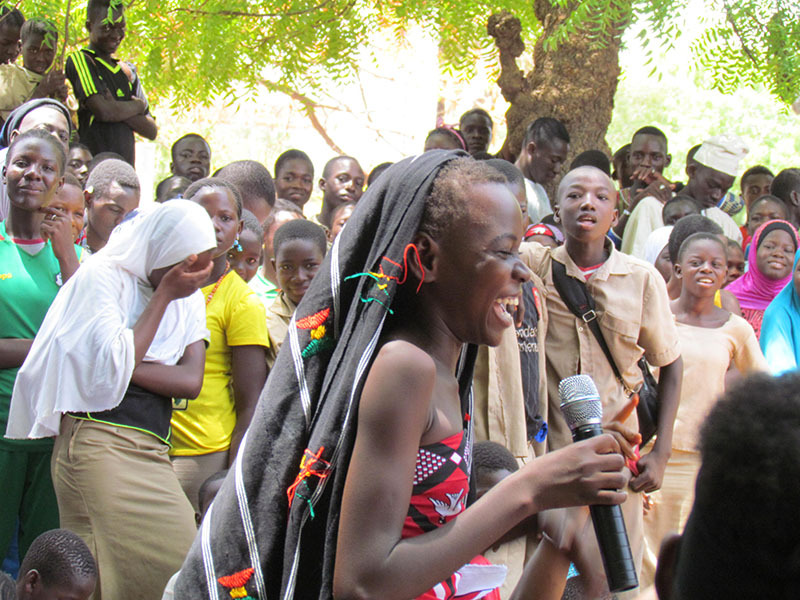 The Club of Awakening Girls perform a skit about MHM. 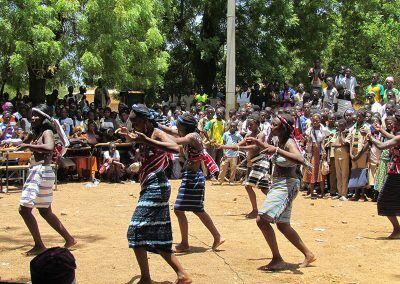 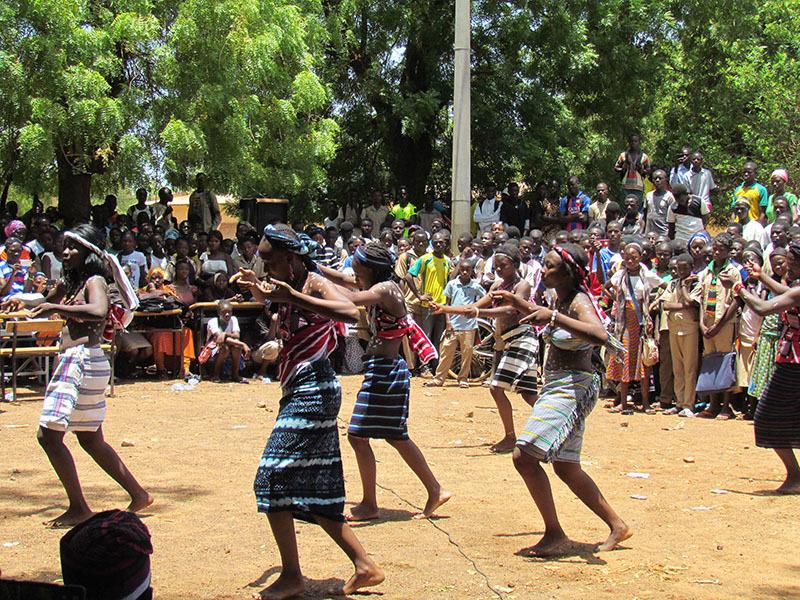 The play was performed during the school’s day of traditional culture. 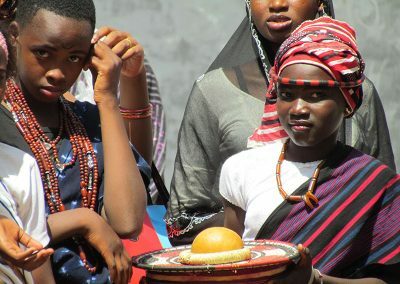 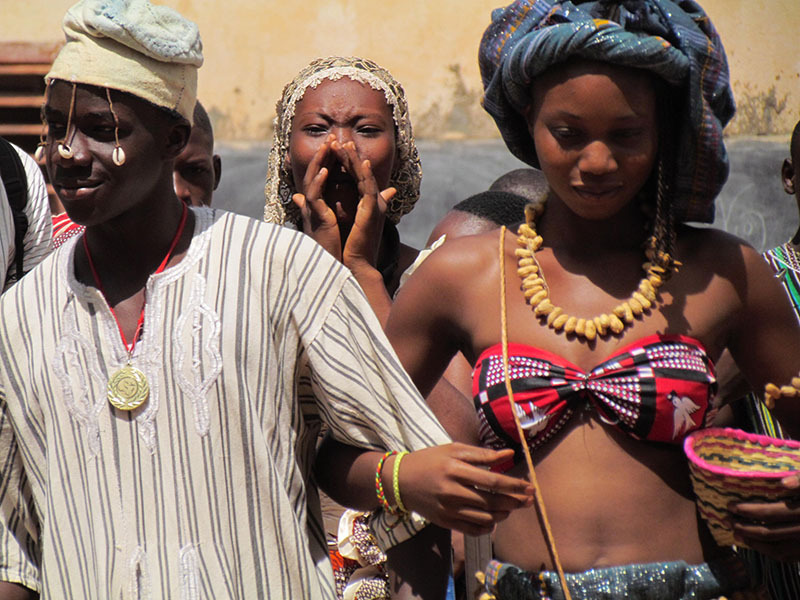 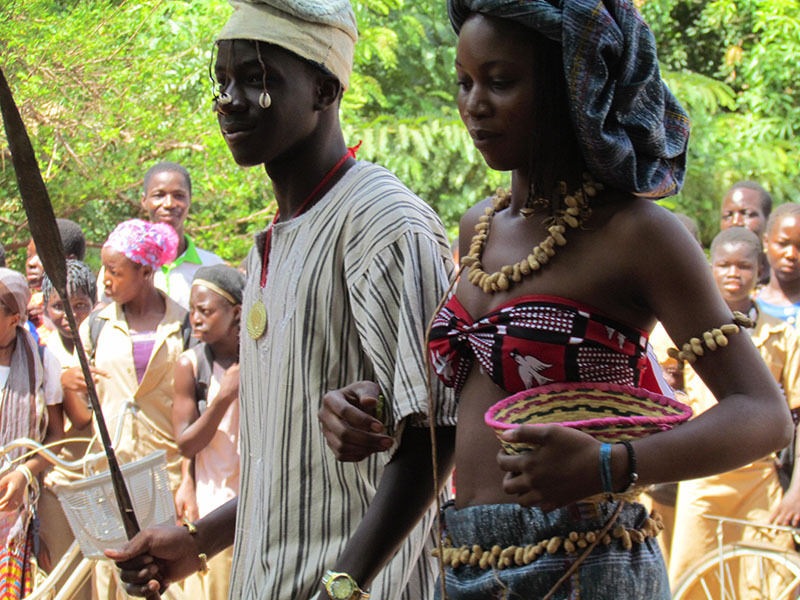 Students dressed up in their traditional dress. 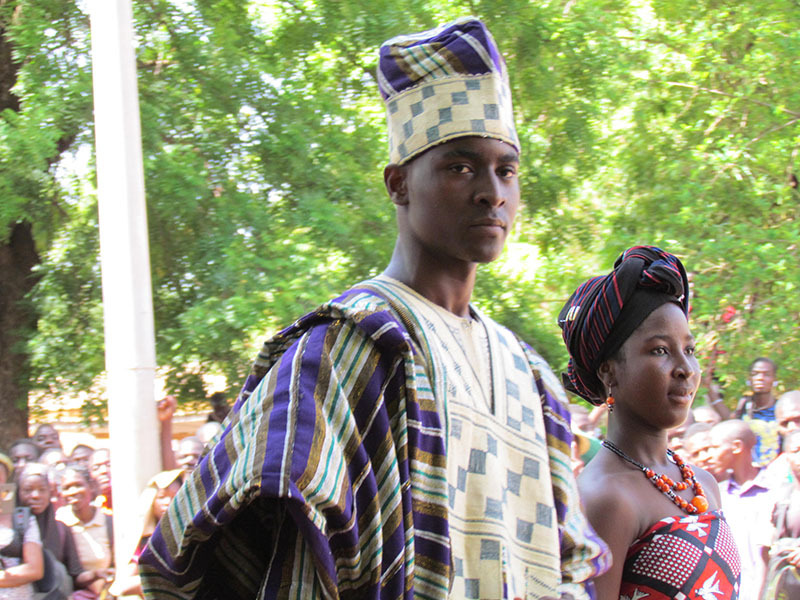 This student’s clothing was most likely handed down to him from his elders. 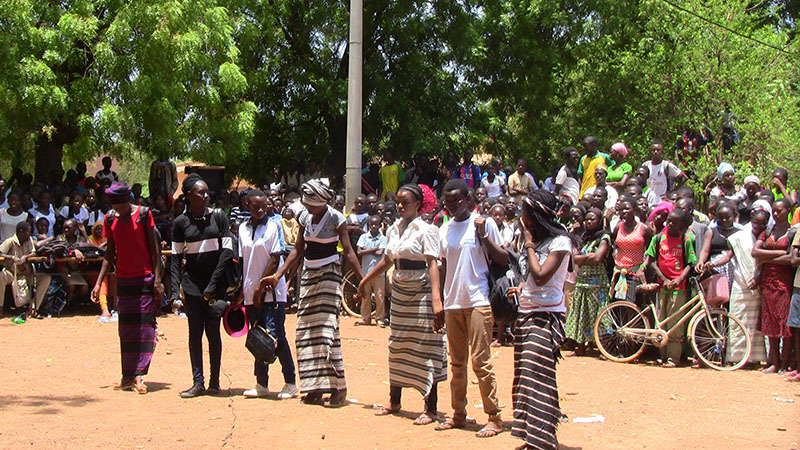 The Club of Awakening Girls performed a skit about teenage pregnancy. 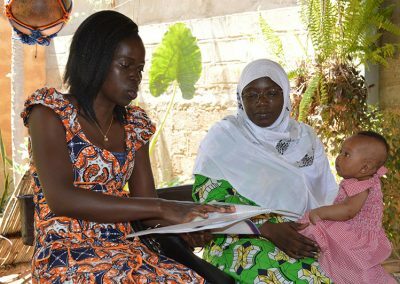 The mother explains to her daughter about her period. 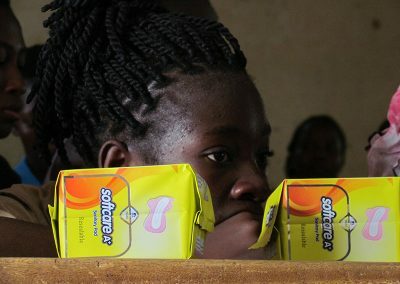 Mom gives daughter a demonstration about using sanitary pads. 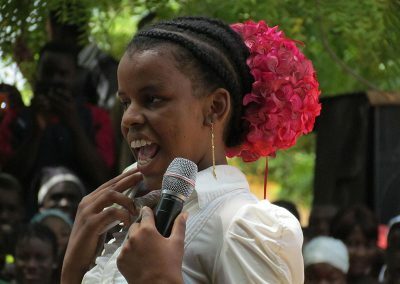 The daughter is embarrassed, the audience laughed. 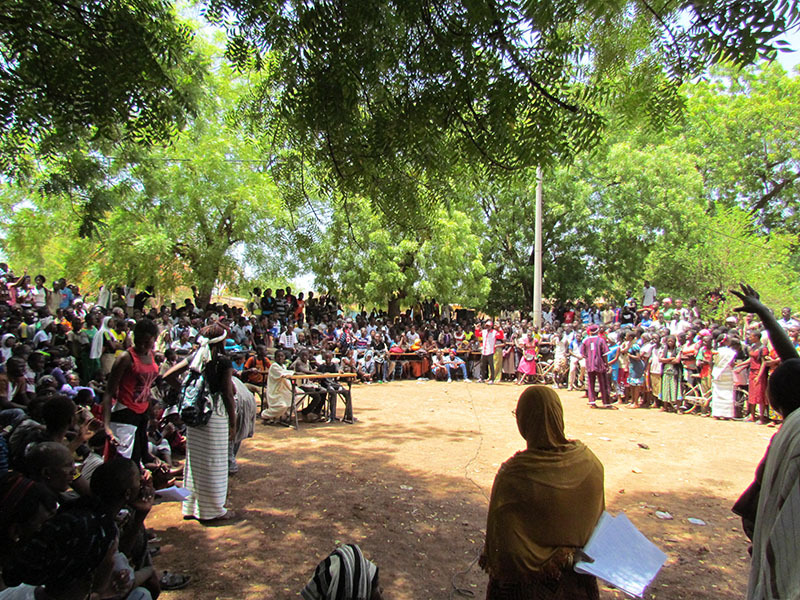 Project leaders proudly watch their students perform. 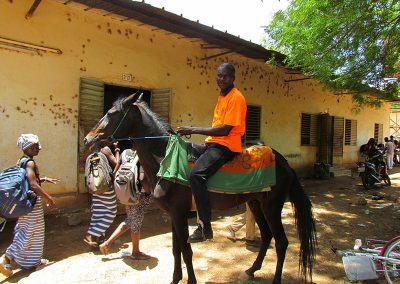 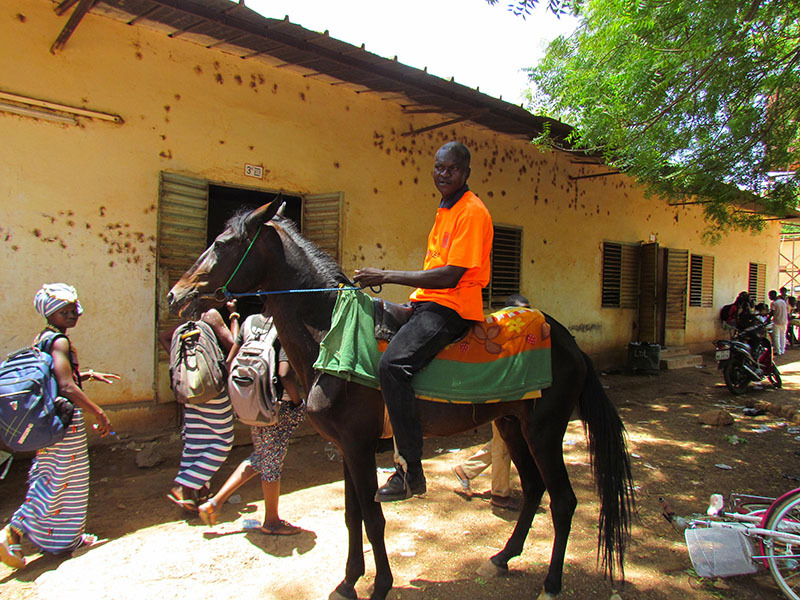 This student came to school on a horse. 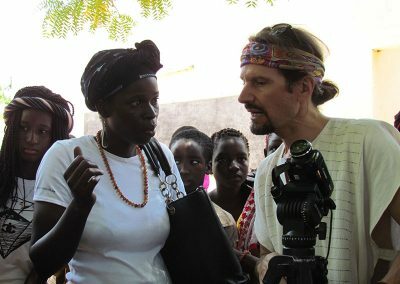 Martine and Esu confer between scenes. 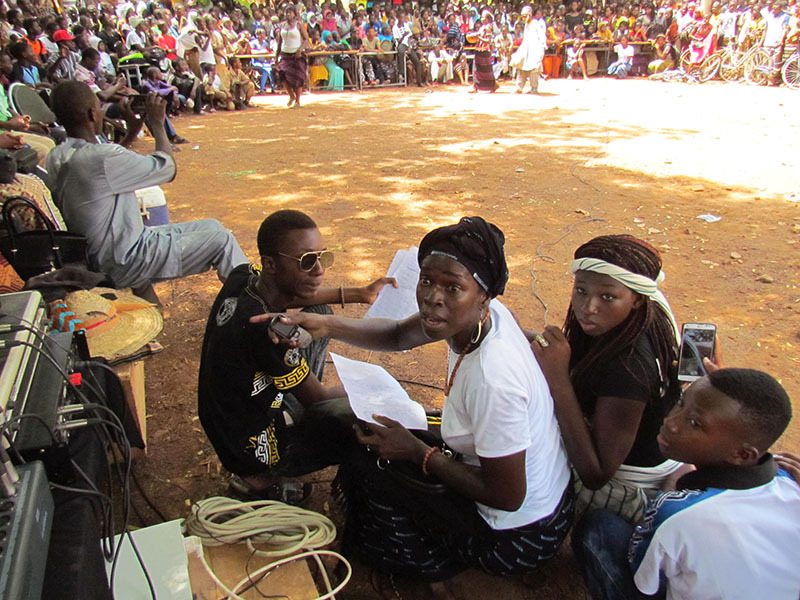 Martine directing things behind the scenes. 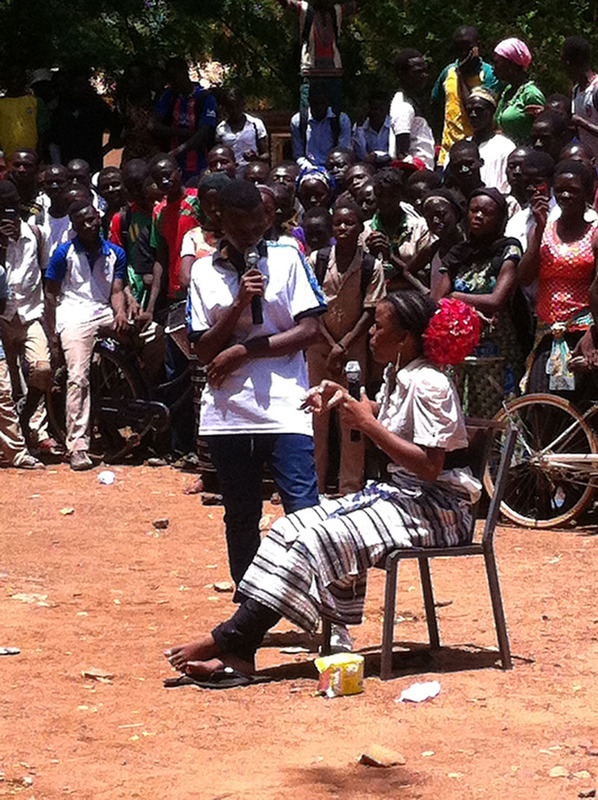 Madame Zalle asked the audience questions after the skit. 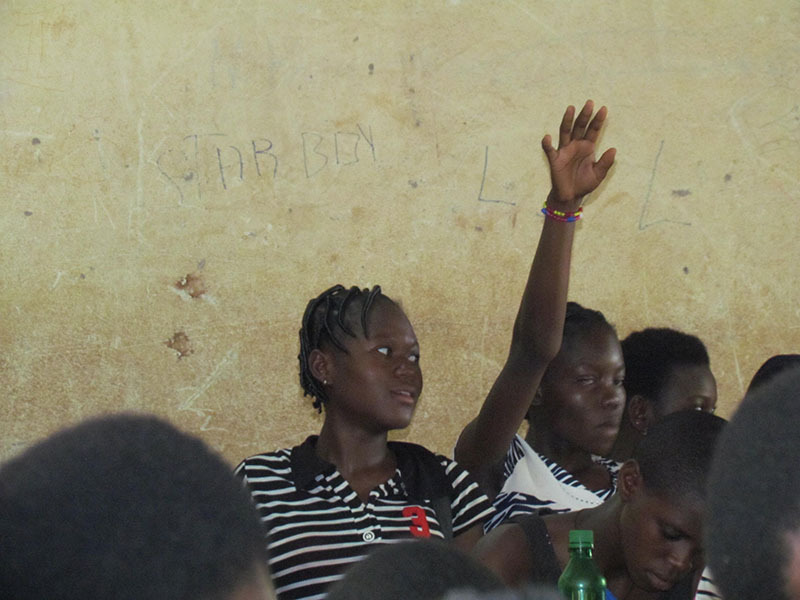 Students try to answer the question correctly. 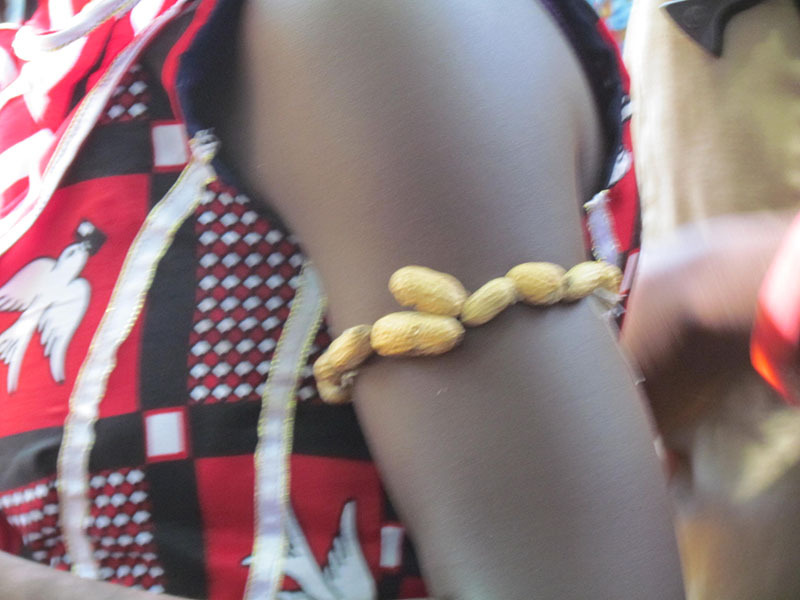 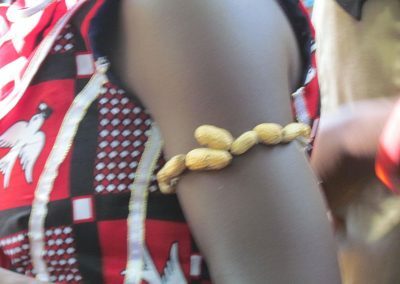 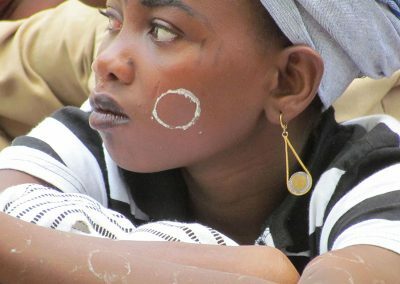 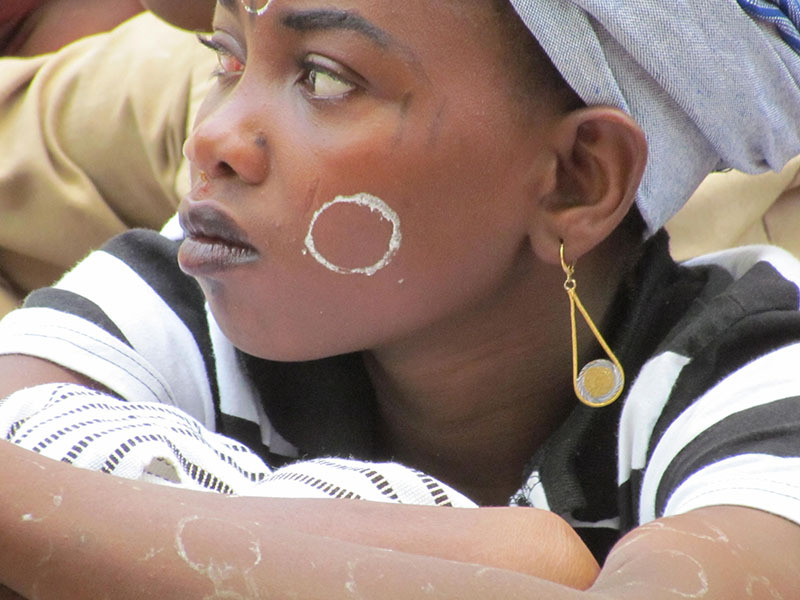 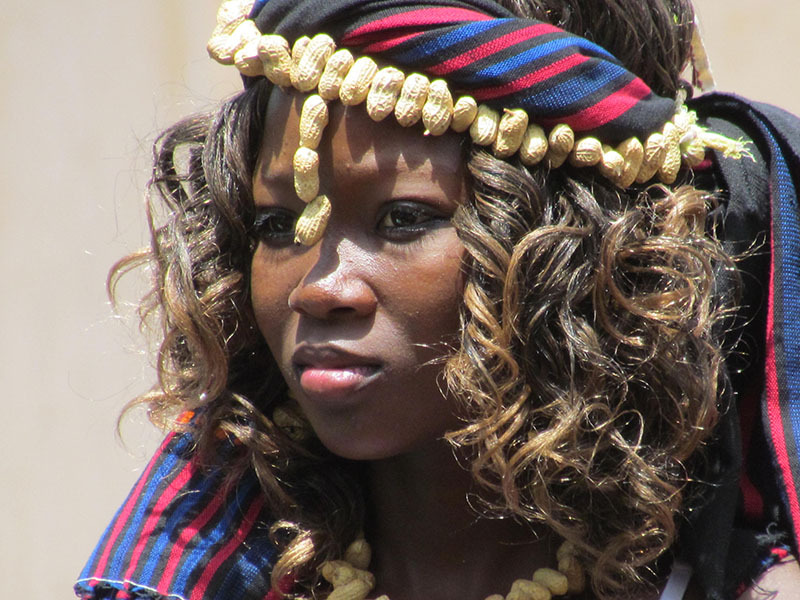 This girl wears a peanut arm band; she comes from a culture which has grown peanuts for centuries. 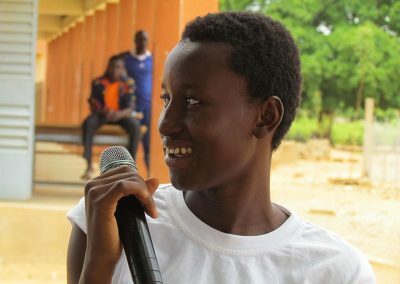 A girl answers a question. 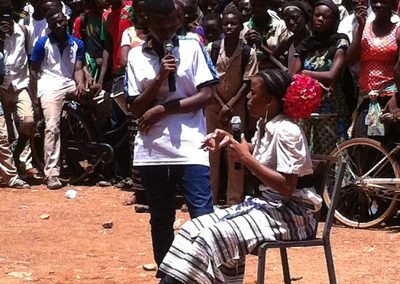 Madame Zalle asks more questions after the 2nd skit about MHM. 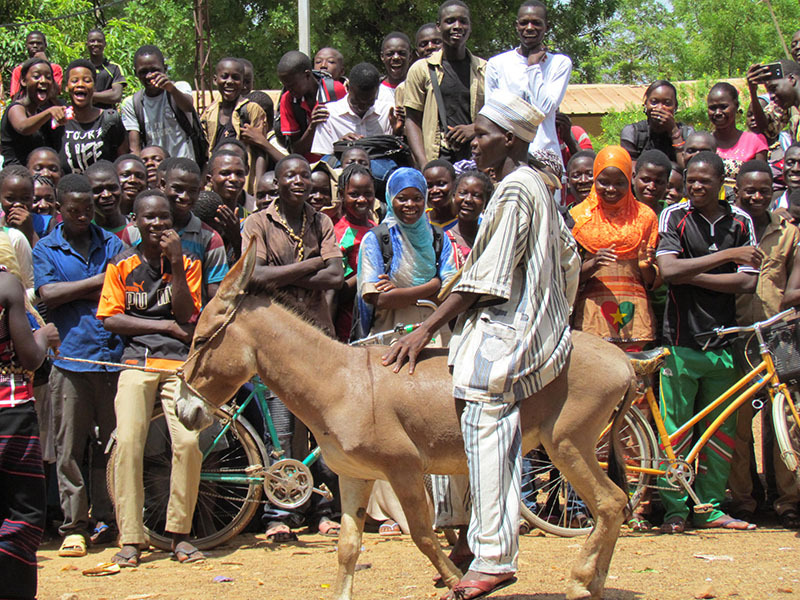 This young man displayed his traditional clothes while riding on a donkey. 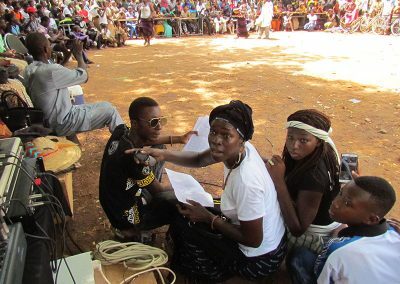 Actor in the MHM skit. Ina and the audience watch on. 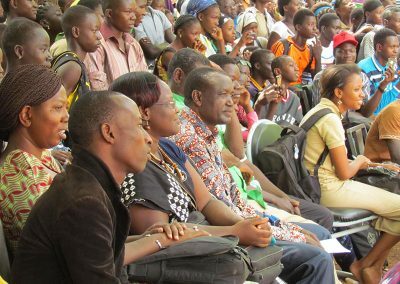 The principal, administration and teachers look on. 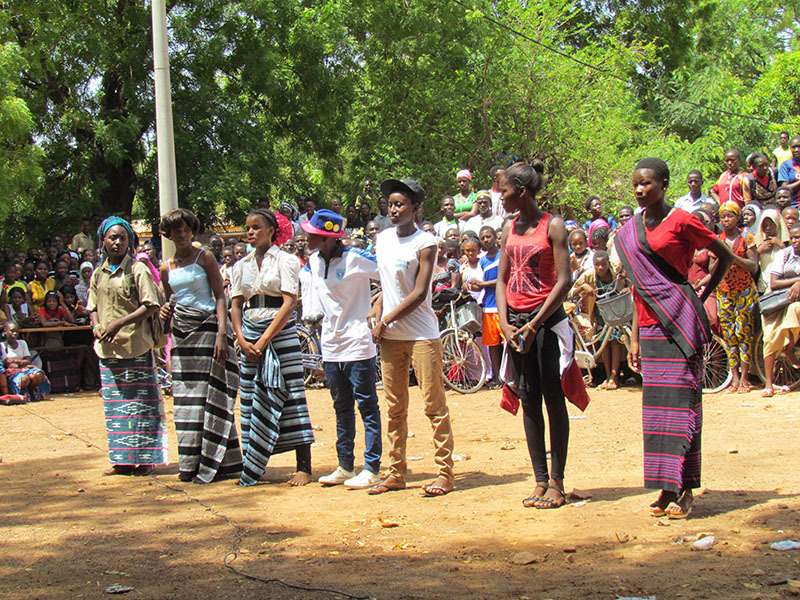 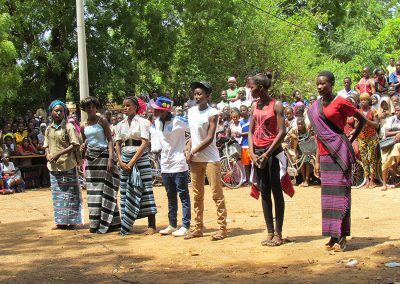 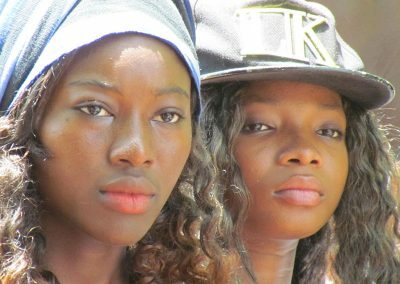 The Club of Awakening Girls also performed the skit at Lycee Communal de Fada (Fada’s public high school). 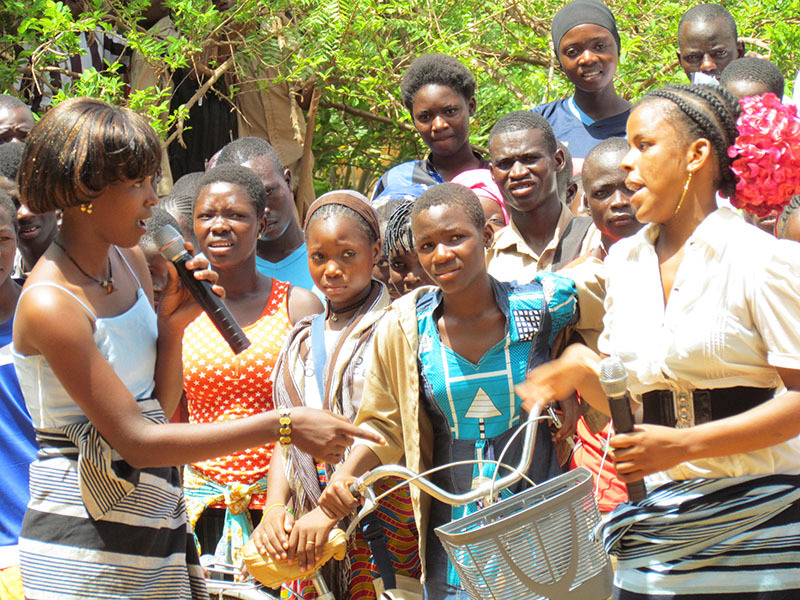 Onlookers answered questions for prizes. 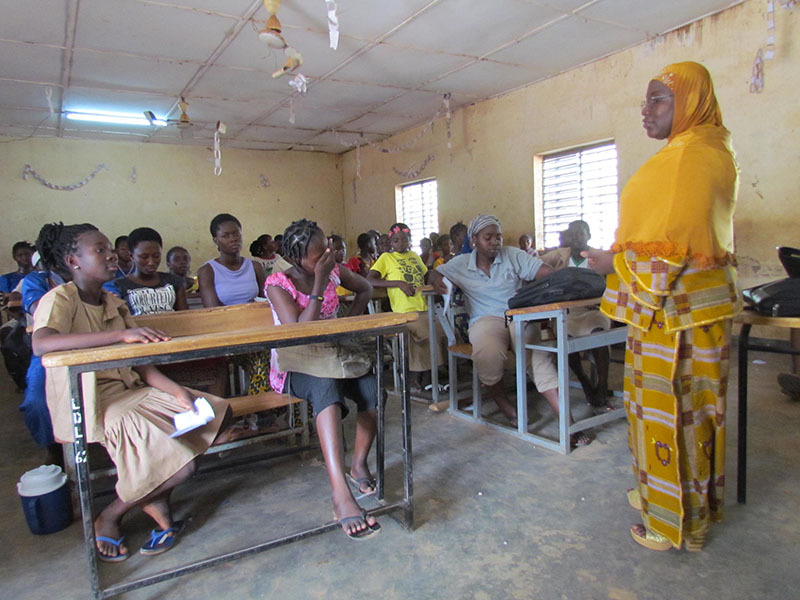 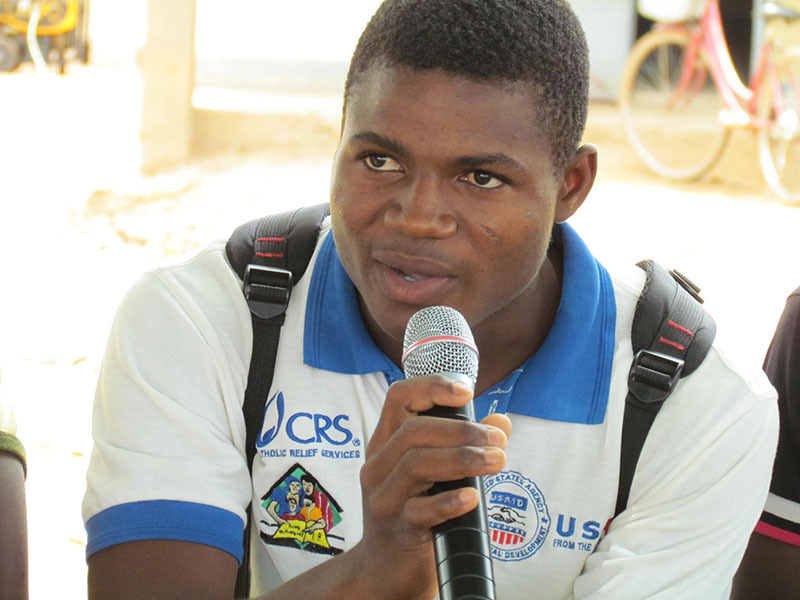 The MHM trainings also sensitized boys, as well as parents and even teachers.